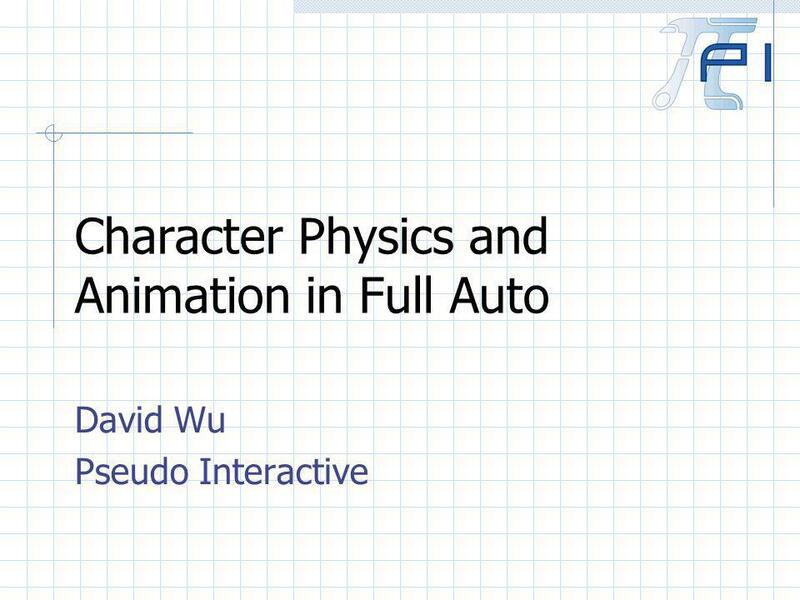 Character Physics and Animation in Full Auto David Wu Pseudo Interactive. 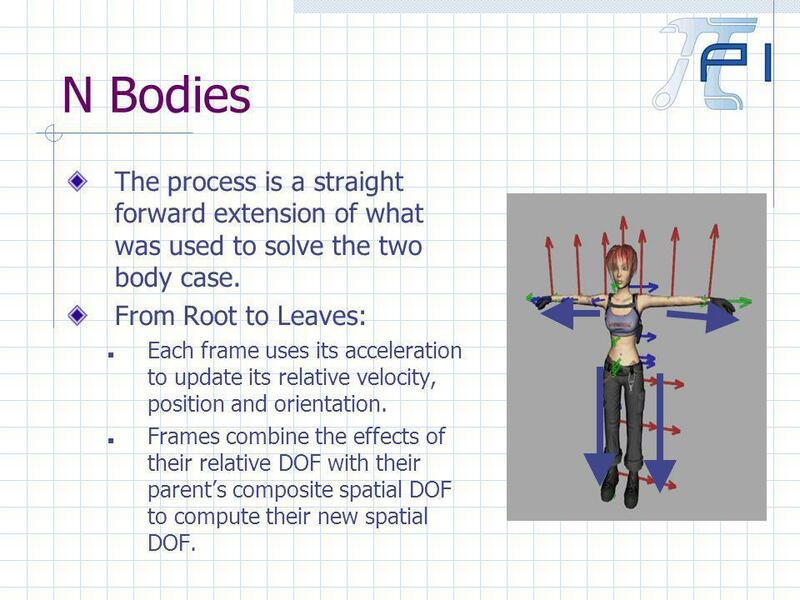 2 Introduction Physical simulation of characters is an important problem in games. 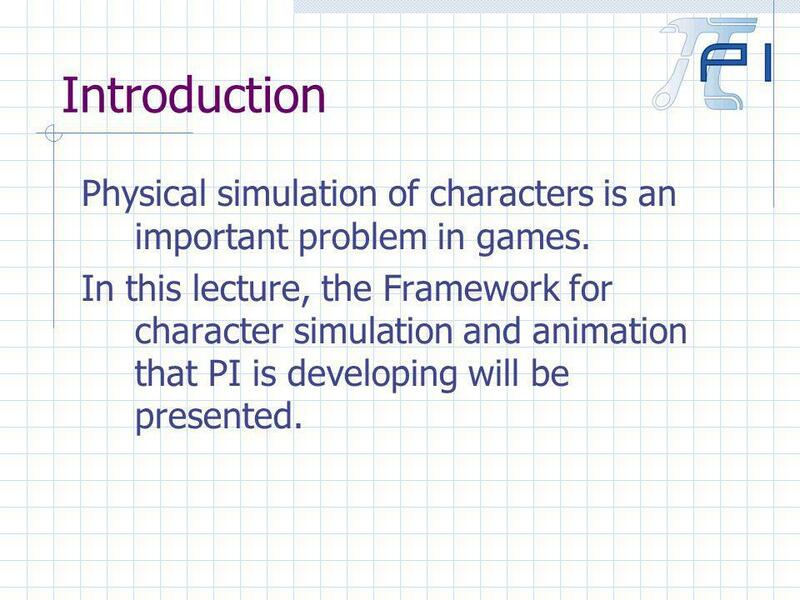 In this lecture, the Framework for character simulation and animation that PI is developing will be presented. 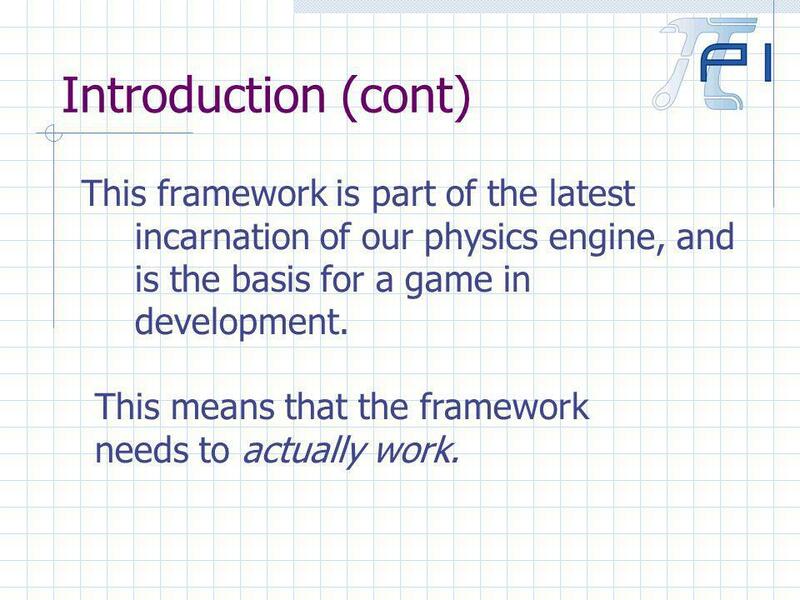 3 Introduction (cont) This framework is part of the latest incarnation of our physics engine, and is the basis for a game in development. 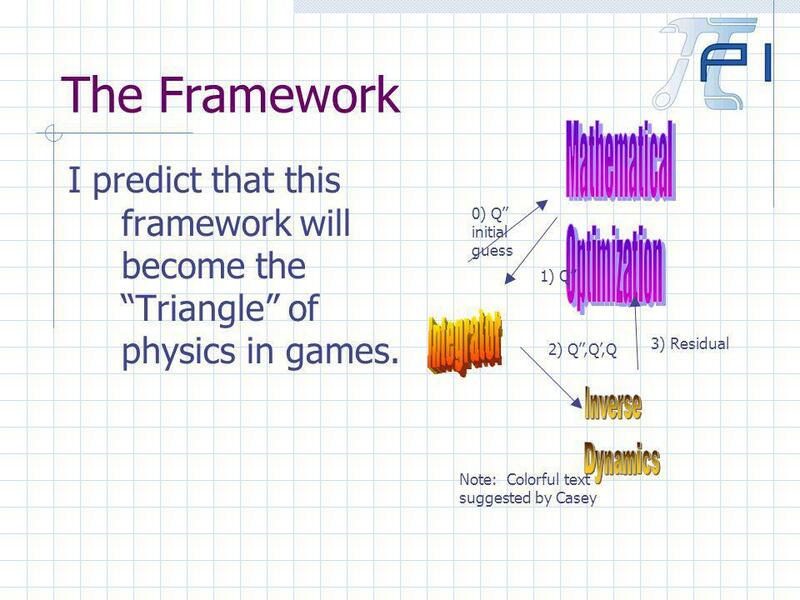 This means that the framework needs to actually work. 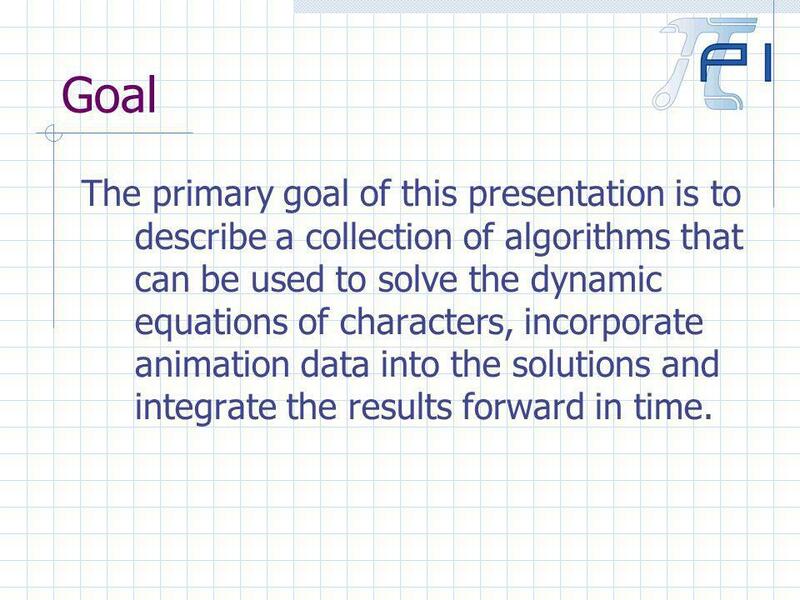 4 Goal The primary goal of this presentation is to describe a collection of algorithms that can be used to solve the dynamic equations of characters, incorporate animation data into the solutions and integrate the results forward in time. 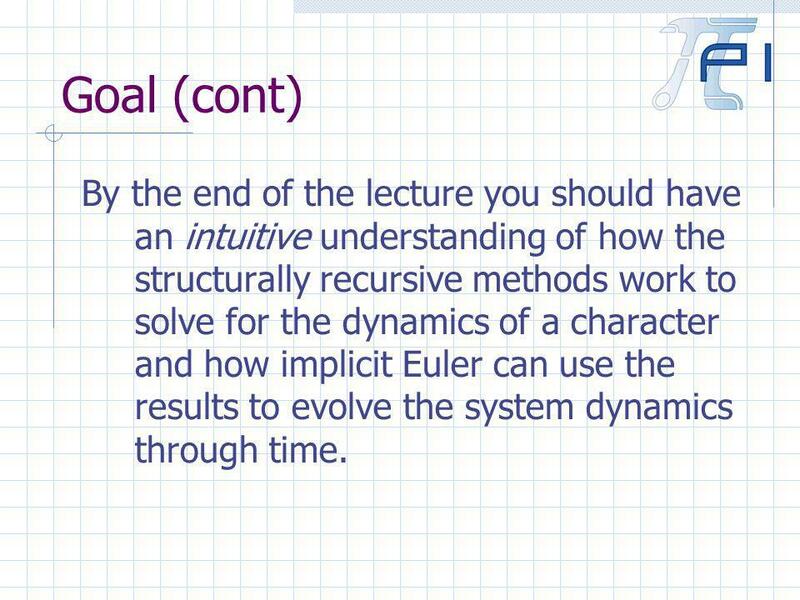 6 Goal (cont) By the end of the lecture you should have an intuitive understanding of how the structurally recursive methods work to solve for the dynamics of a character and how implicit Euler can use the results to evolve the system dynamics through time. 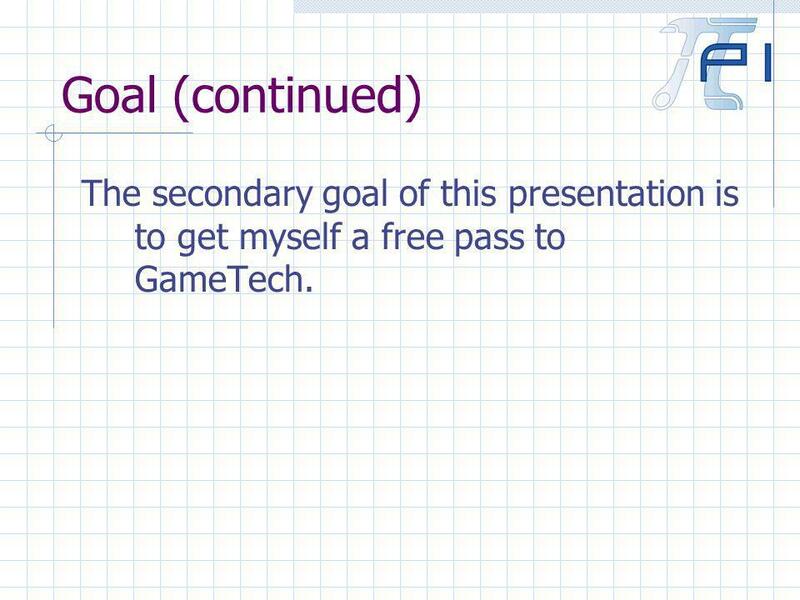 9 Goal (continued) The secondary goal of this presentation is to get myself a free pass to GameTech. 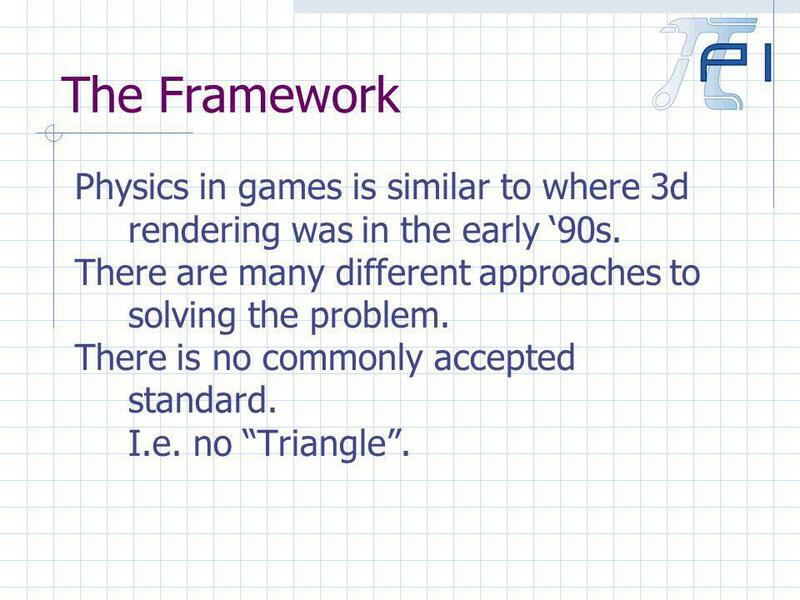 10 The Framework Physics in games is similar to where 3d rendering was in the early 90s. 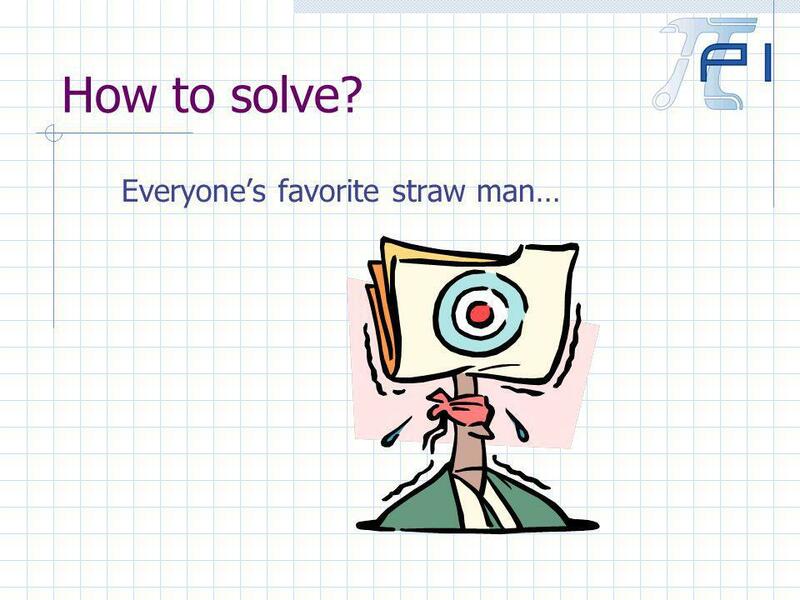 There are many different approaches to solving the problem. There is no commonly accepted standard. I.e. no Triangle. 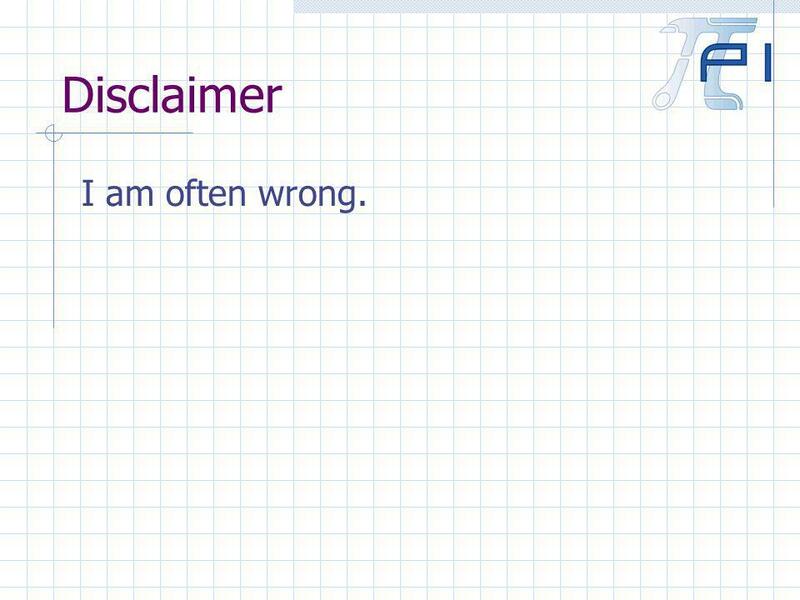 13 Disclaimer I am often wrong. 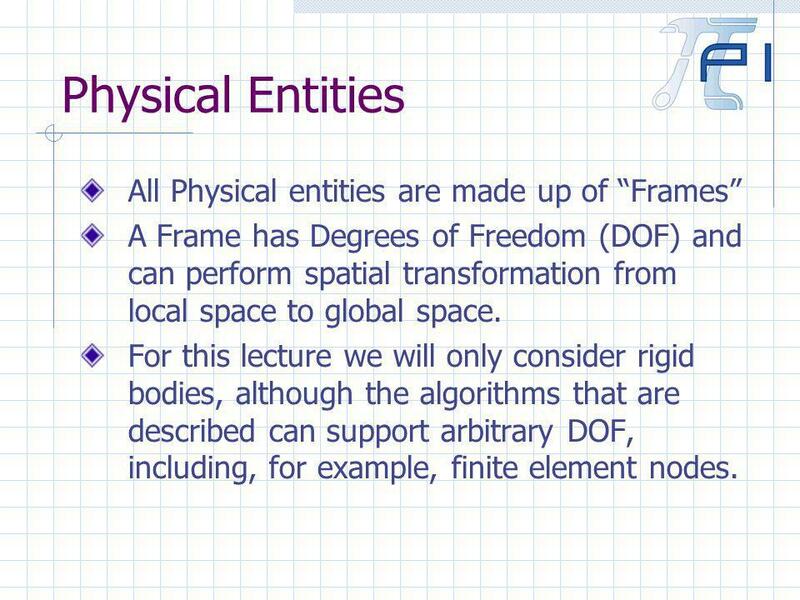 14 Physical Entities All Physical entities are made up of Frames A Frame has Degrees of Freedom (DOF) and can perform spatial transformation from local space to global space. 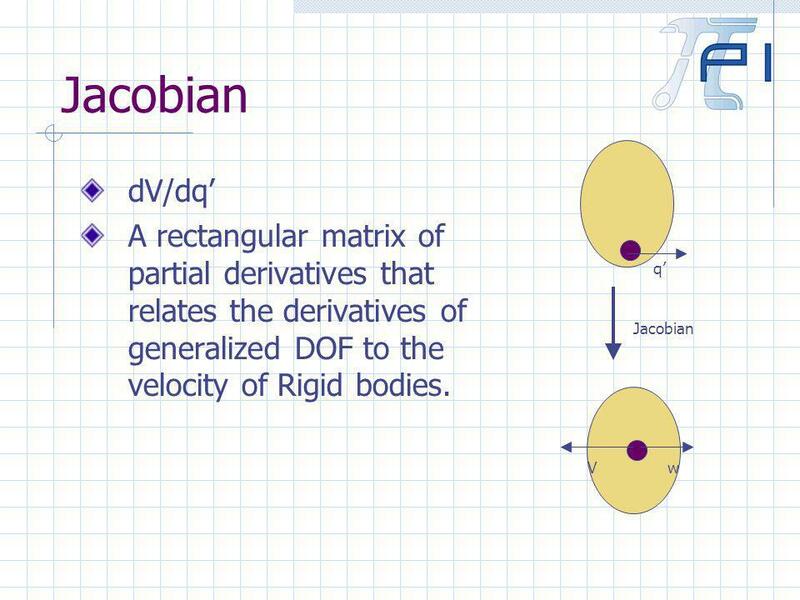 For this lecture we will only consider rigid bodies, although the algorithms that are described can support arbitrary DOF, including, for example, finite element nodes. 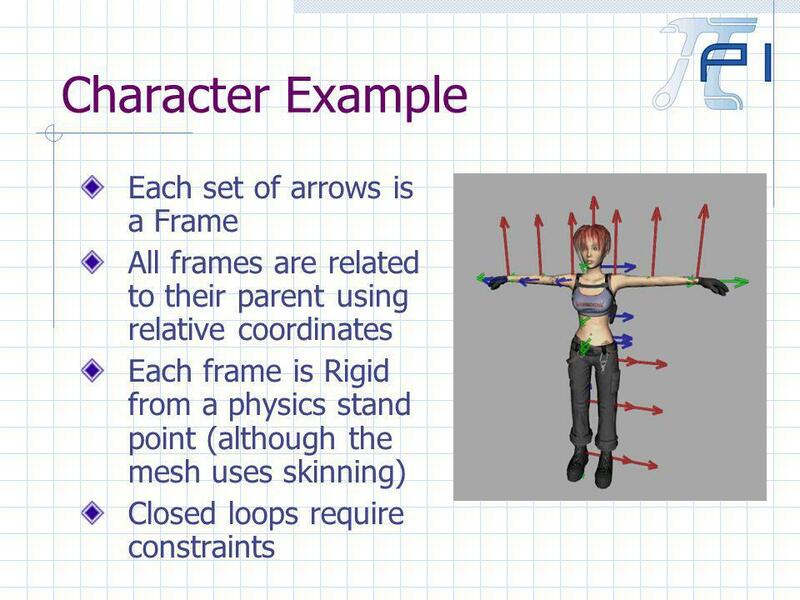 17 Physics of Characters There are a number of ways to derive the dynamics of characters. 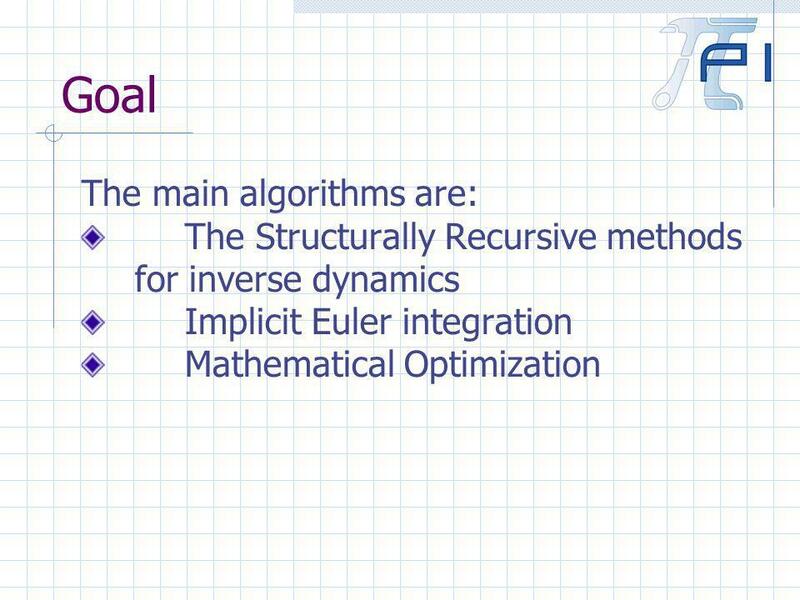 The method that I will describe is based on the structurally recursive methods. 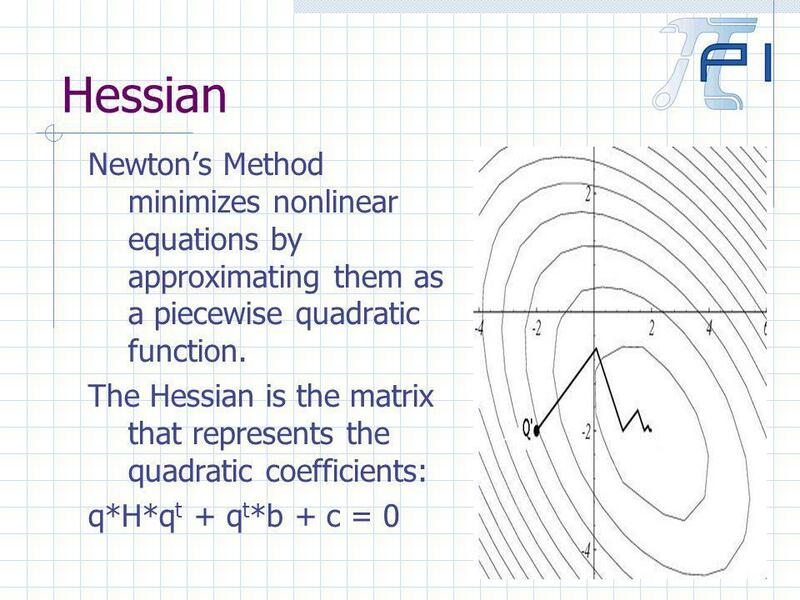 There are a number related techniques that all use the same concepts: Featherstone's method Articulated Rigid Body Method Recursive Newton-Euler Equations Composite Rigid Body Method Etc. 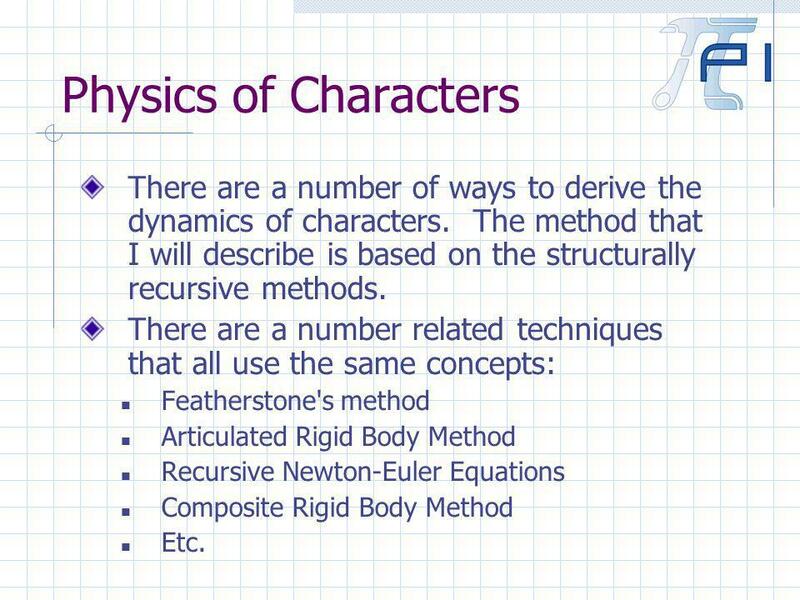 18 Physics of Characters An intuitive understand of how the method works is important. 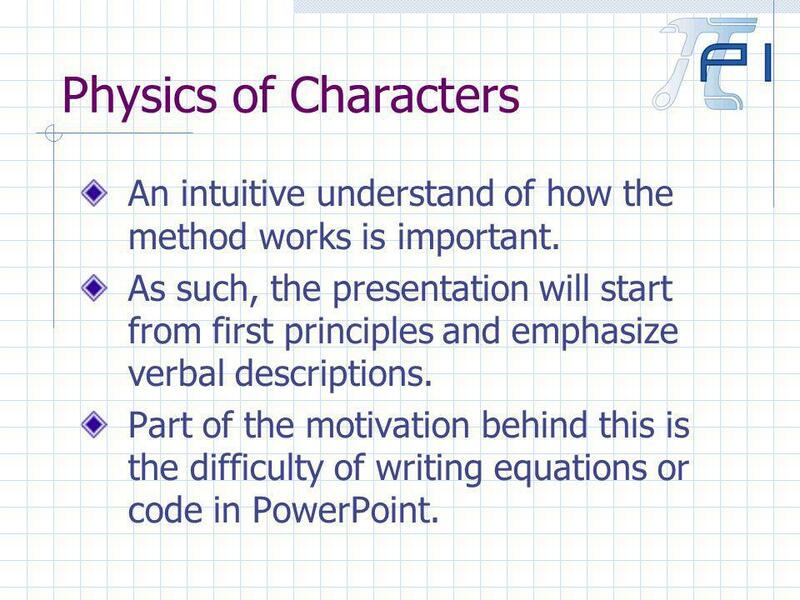 As such, the presentation will start from first principles and emphasize verbal descriptions. 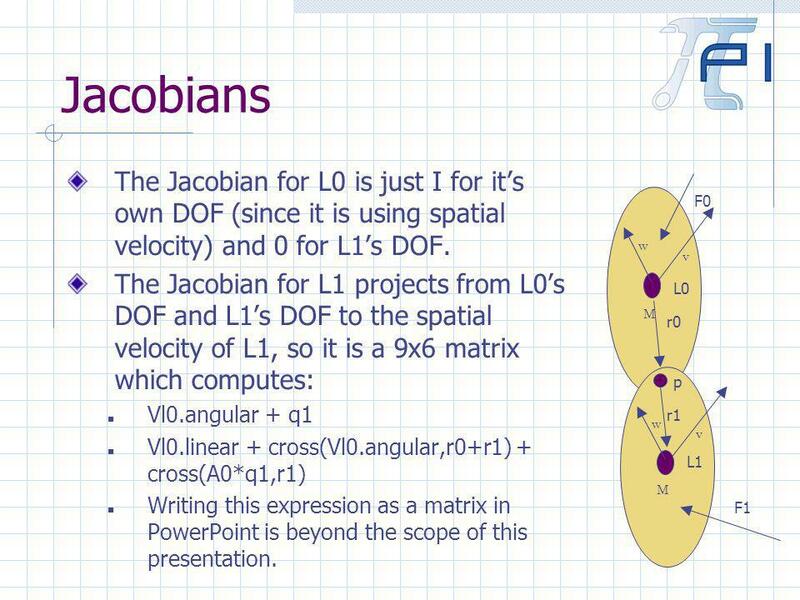 Part of the motivation behind this is the difficulty of writing equations or code in PowerPoint. 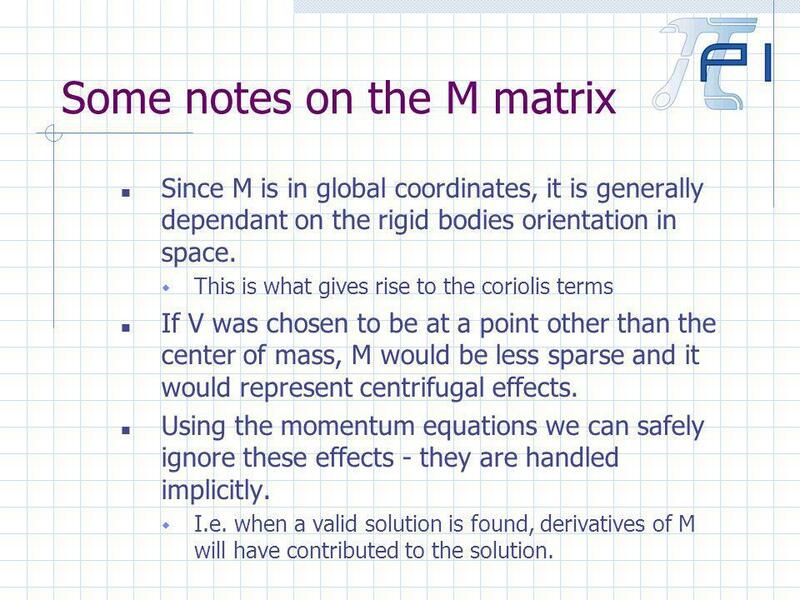 20 Some notes on the M matrix Since M is in global coordinates, it is generally dependant on the rigid bodies orientation in space. 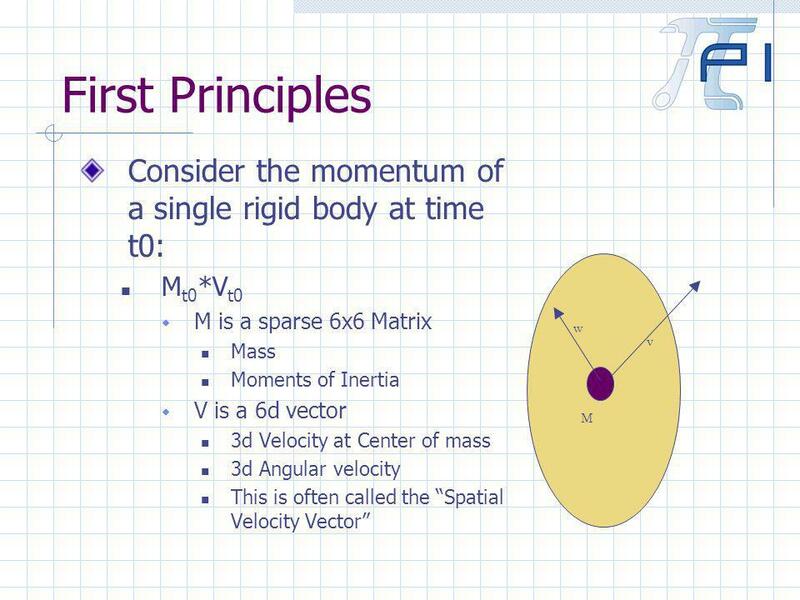 This is what gives rise to the coriolis terms If V was chosen to be at a point other than the center of mass, M would be less sparse and it would represent centrifugal effects. 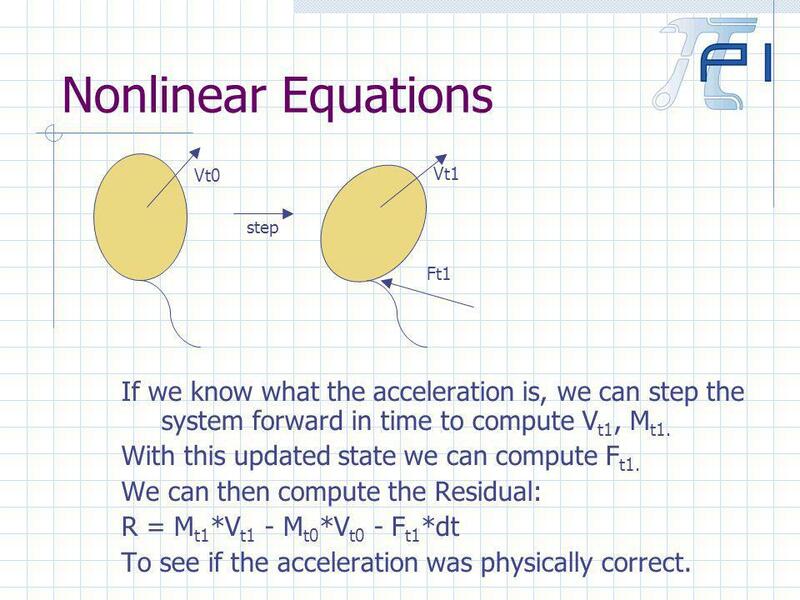 Using the momentum equations we can safely ignore these effects - they are handled implicitly. I.e. 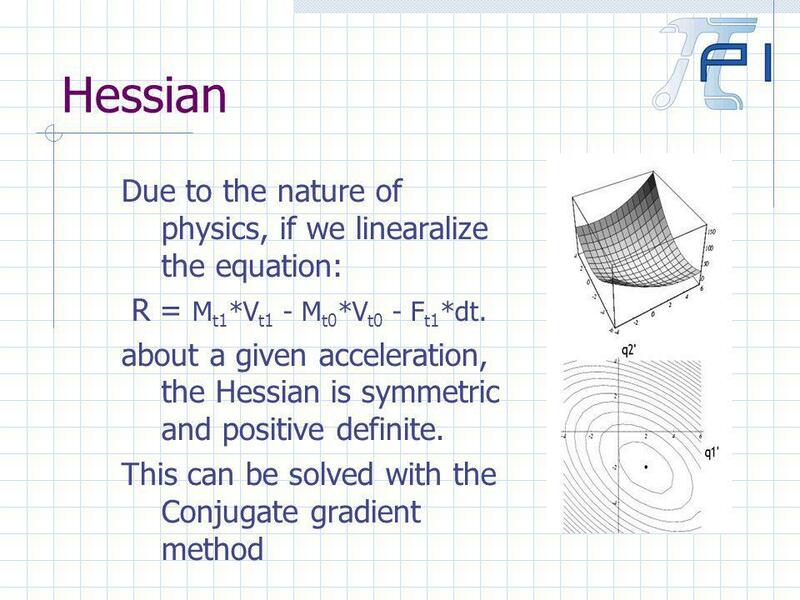 when a valid solution is found, derivatives of M will have contributed to the solution. 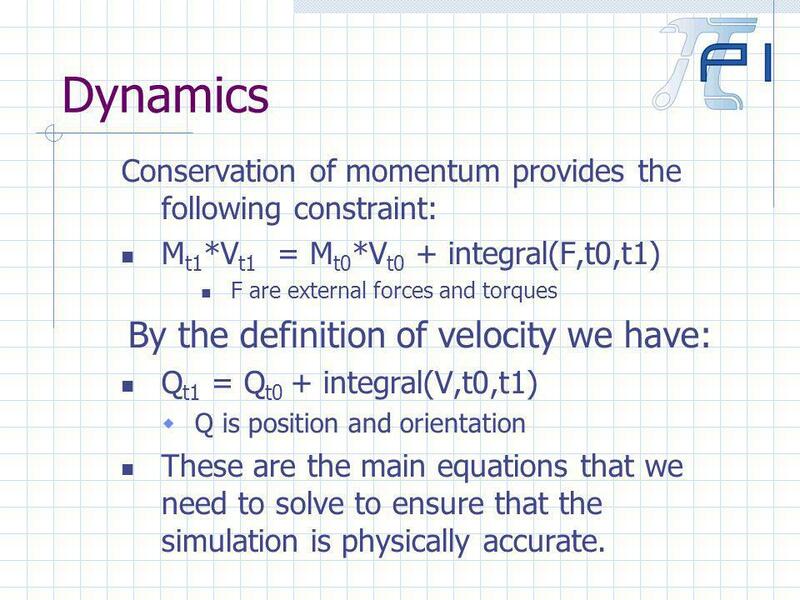 21 Dynamics Conservation of momentum provides the following constraint: M t1 *V t1 = M t0 *V t0 + integral(F,t0,t1) F are external forces and torques By the definition of velocity we have: Q t1 = Q t0 + integral(V,t0,t1) Q is position and orientation These are the main equations that we need to solve to ensure that the simulation is physically accurate. 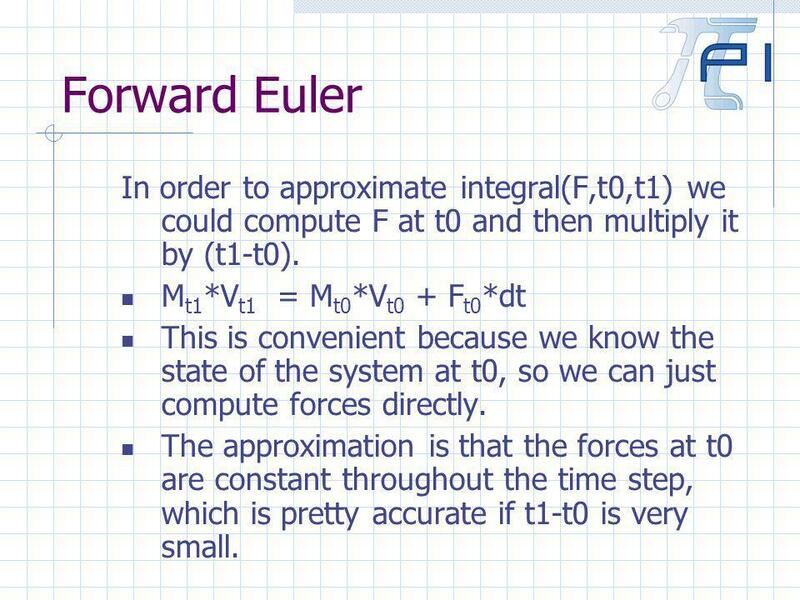 23 Forward Euler In order to approximate integral(F,t0,t1) we could compute F at t0 and then multiply it by (t1-t0). 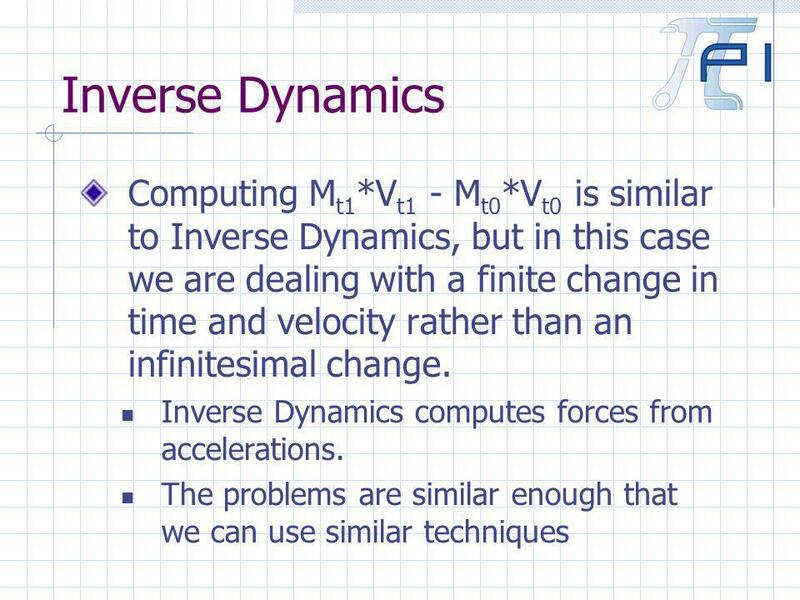 M t1 *V t1 = M t0 *V t0 + F t0 *dt This is convenient because we know the state of the system at t0, so we can just compute forces directly. The approximation is that the forces at t0 are constant throughout the time step, which is pretty accurate if t1-t0 is very small. 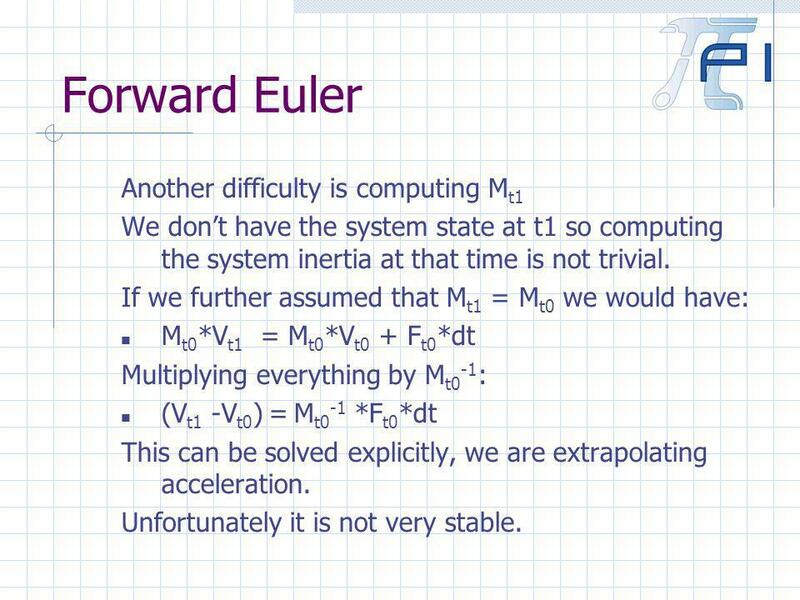 24 Forward Euler Another difficulty is computing M t1 We dont have the system state at t1 so computing the system inertia at that time is not trivial. If we further assumed that M t1 = M t0 we would have: M t0 *V t1 = M t0 *V t0 + F t0 *dt Multiplying everything by M t0 -1 : (V t1 -V t0 ) = M t0 -1 *F t0 *dt This can be solved explicitly, we are extrapolating acceleration. Unfortunately it is not very stable. 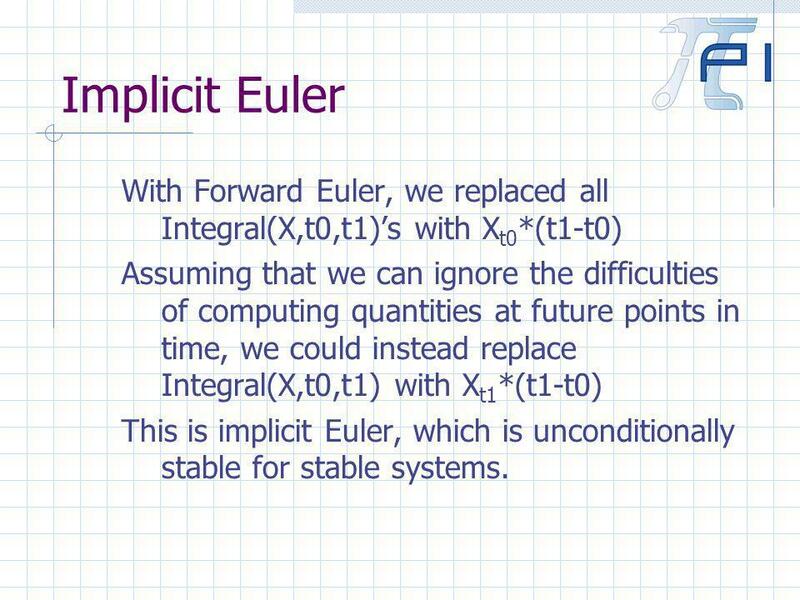 25 Implicit Euler With Forward Euler, we replaced all Integral(X,t0,t1)s with X t0 *(t1-t0) Assuming that we can ignore the difficulties of computing quantities at future points in time, we could instead replace Integral(X,t0,t1) with X t1 *(t1-t0) This is implicit Euler, which is unconditionally stable for stable systems. 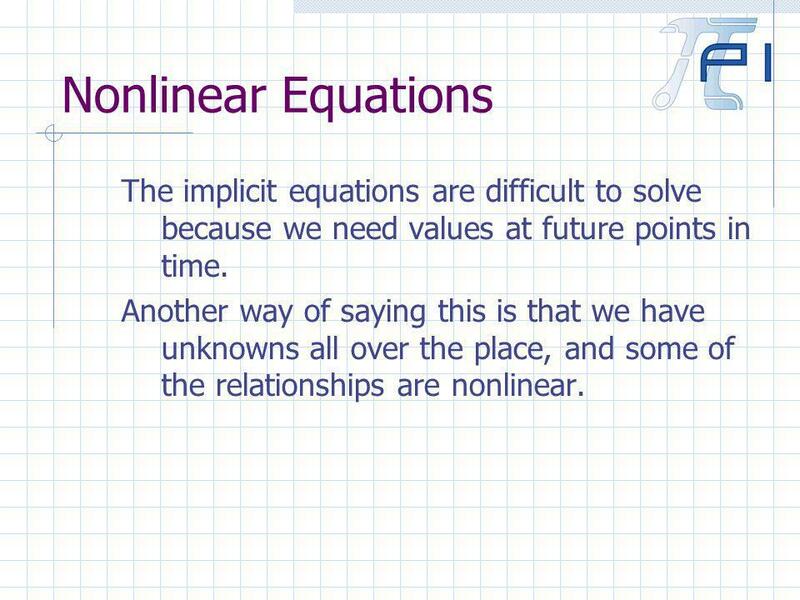 28 Nonlinear Equations The implicit equations are difficult to solve because we need values at future points in time. 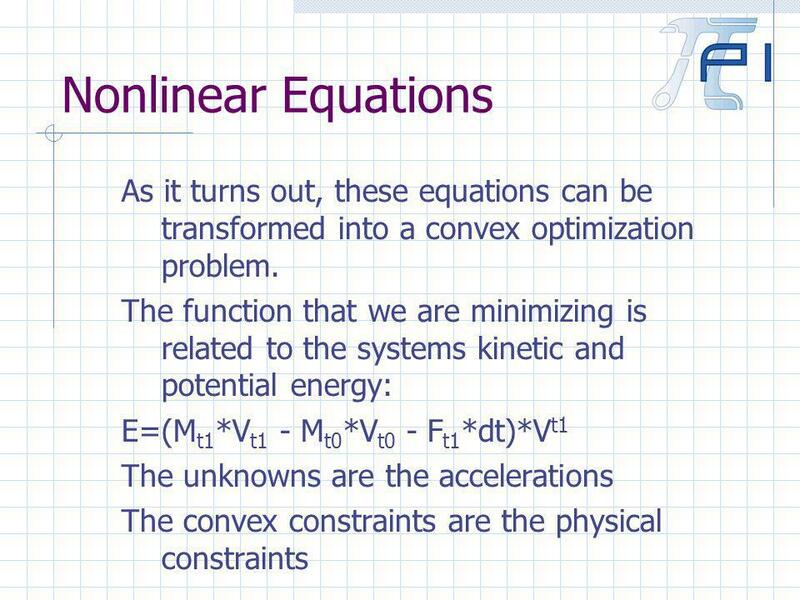 Another way of saying this is that we have unknowns all over the place, and some of the relationships are nonlinear. 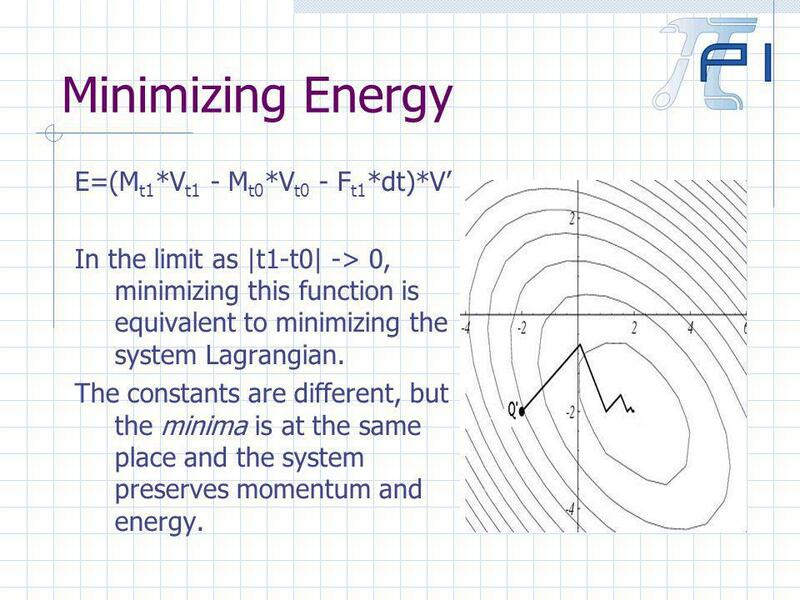 31 Minimizing Energy E=(M t1 *V t1 - M t0 *V t0 - F t1 *dt)*V In the limit as |t1-t0| -> 0, minimizing this function is equivalent to minimizing the system Lagrangian. 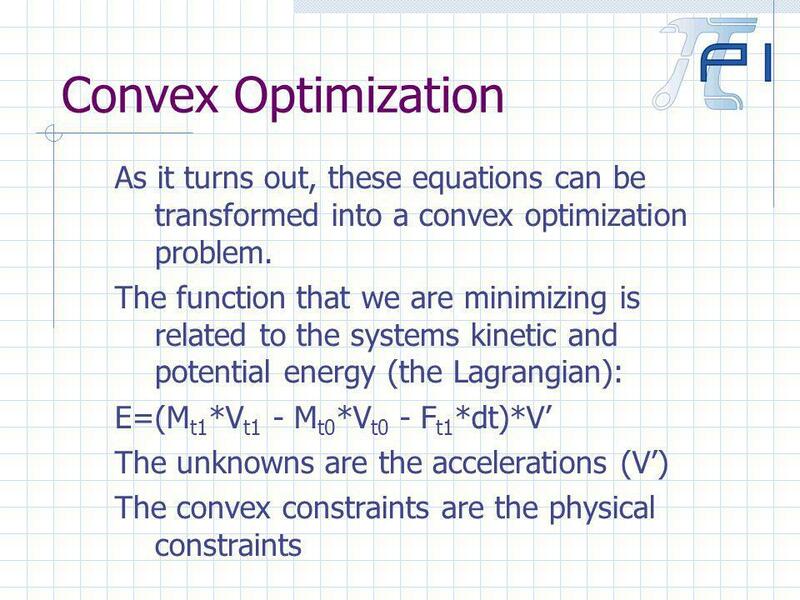 The constants are different, but the minima is at the same place and the system preserves momentum and energy. 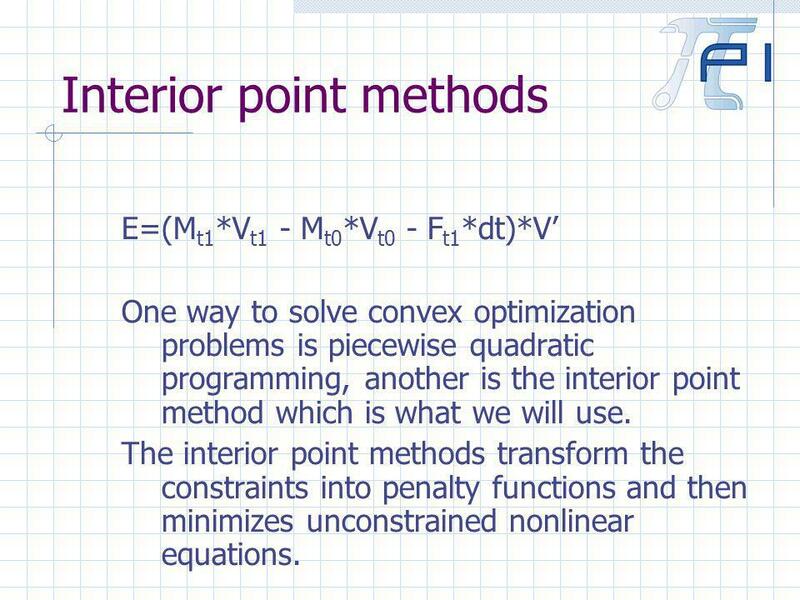 32 Interior point methods E=(M t1 *V t1 - M t0 *V t0 - F t1 *dt)*V One way to solve convex optimization problems is piecewise quadratic programming, another is the interior point method which is what we will use. 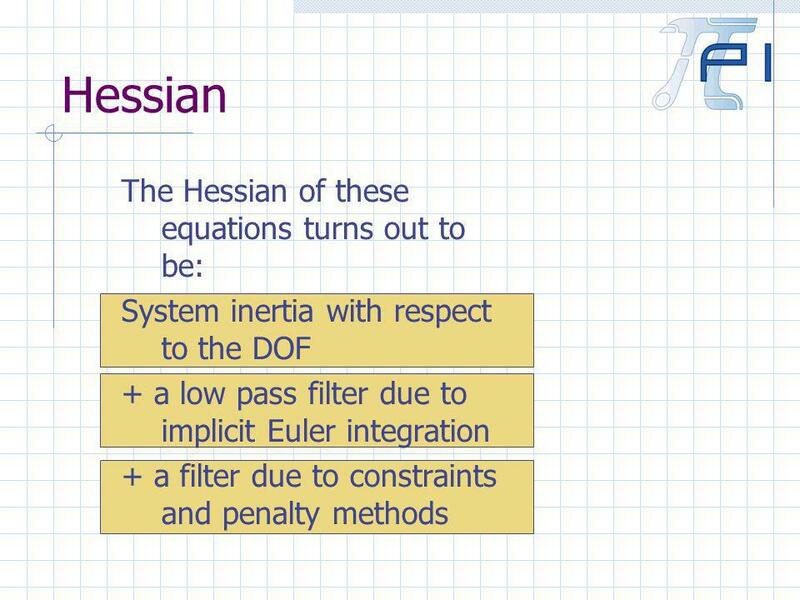 The interior point methods transform the constraints into penalty functions and then minimizes unconstrained nonlinear equations. 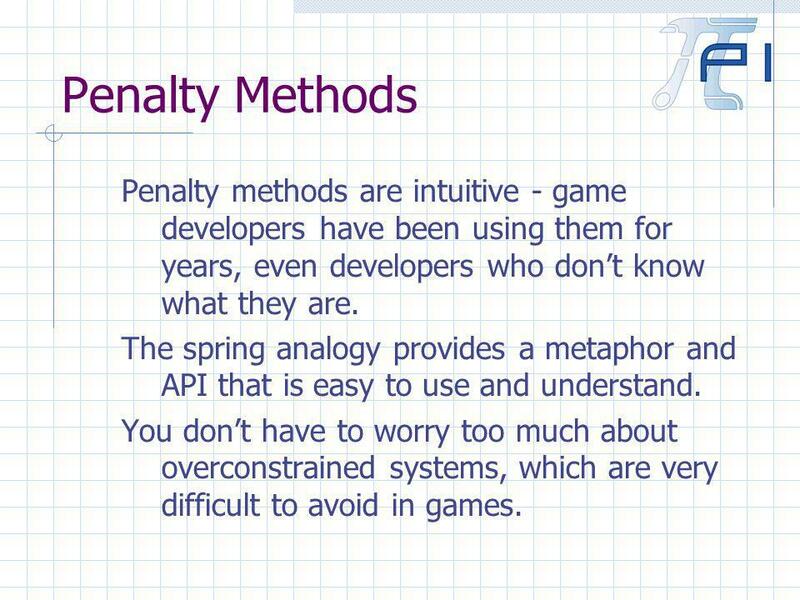 33 Penalty Methods Penalty methods are intuitive - game developers have been using them for years, even developers who dont know what they are. 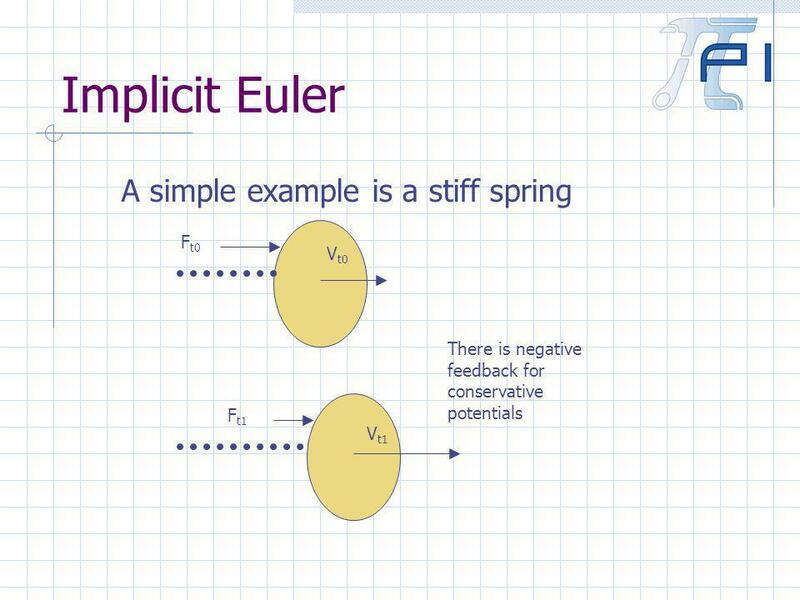 The spring analogy provides a metaphor and API that is easy to use and understand. 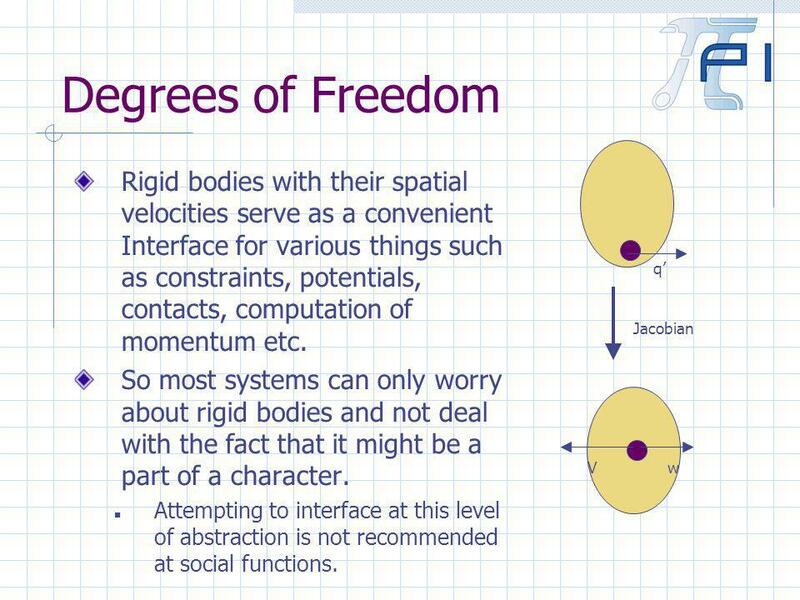 You dont have to worry too much about overconstrained systems, which are very difficult to avoid in games. 36 Minimizing Residual For a given acceleration we compute R = M t1 *V t1 - M t0 *V t0 - F t1 *dt. 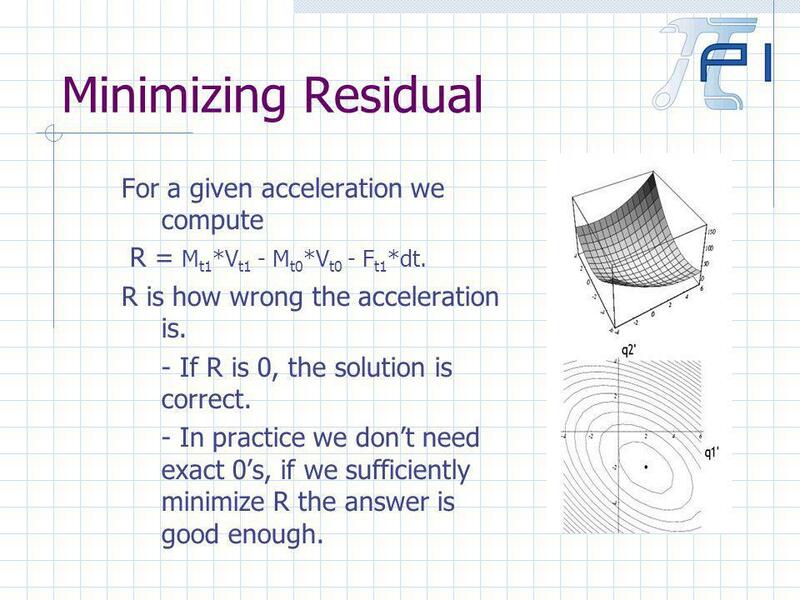 R is how wrong the acceleration is. - If R is 0, the solution is correct. 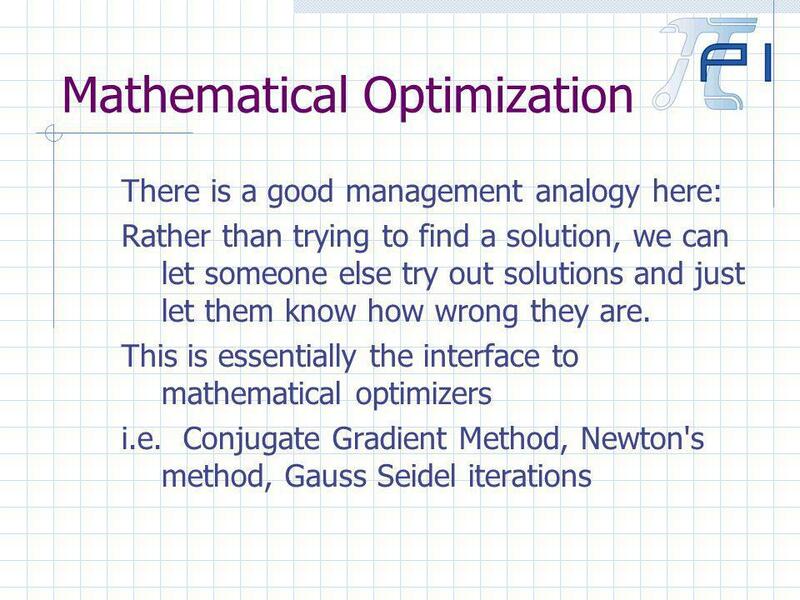 - In practice we dont need exact 0s, if we sufficiently minimize R the answer is good enough. 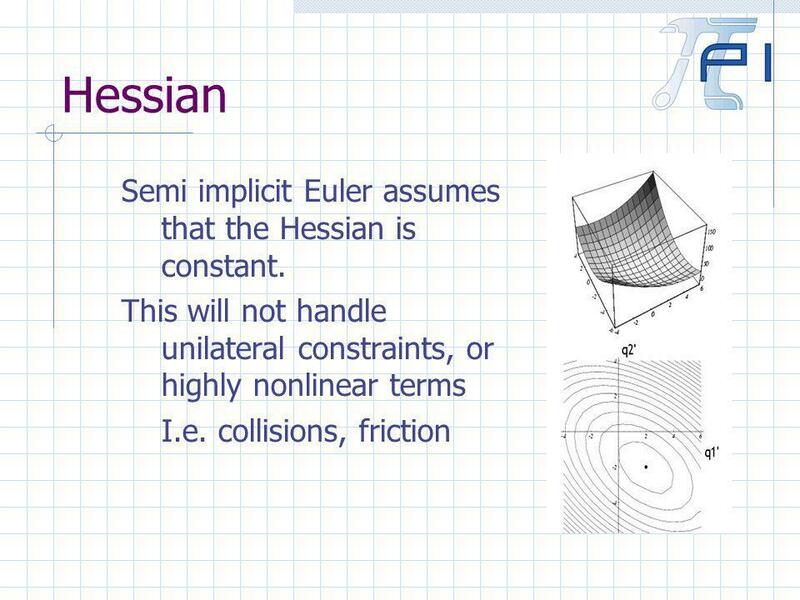 43 Truncated Newton Fully implicit Euler requires a full non linear solve, which handles a non- constant Hessian. 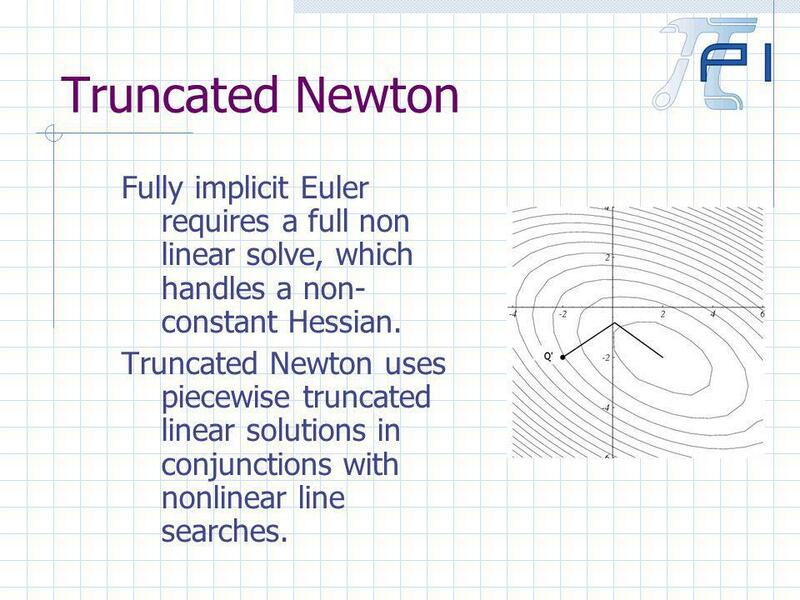 Truncated Newton uses piecewise truncated linear solutions in conjunctions with nonlinear line searches. 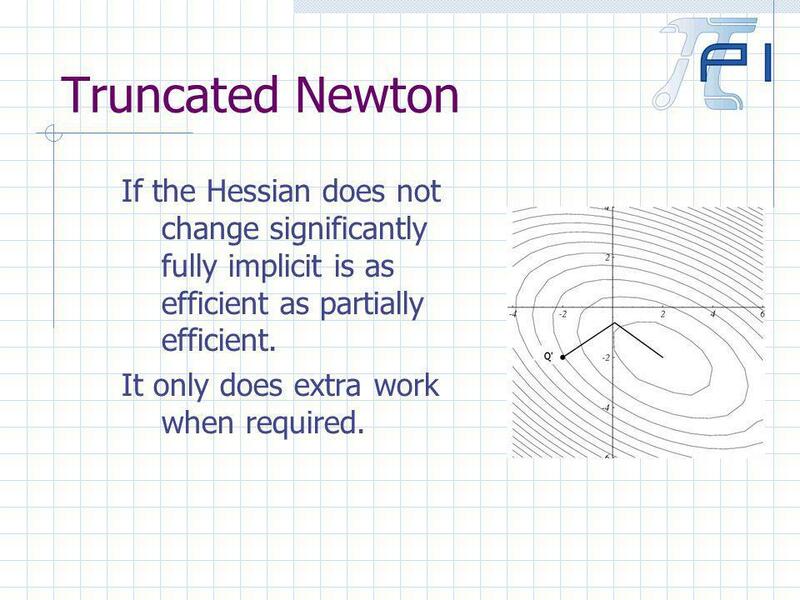 44 Truncated Newton If the Hessian does not change significantly fully implicit is as efficient as partially efficient. It only does extra work when required. 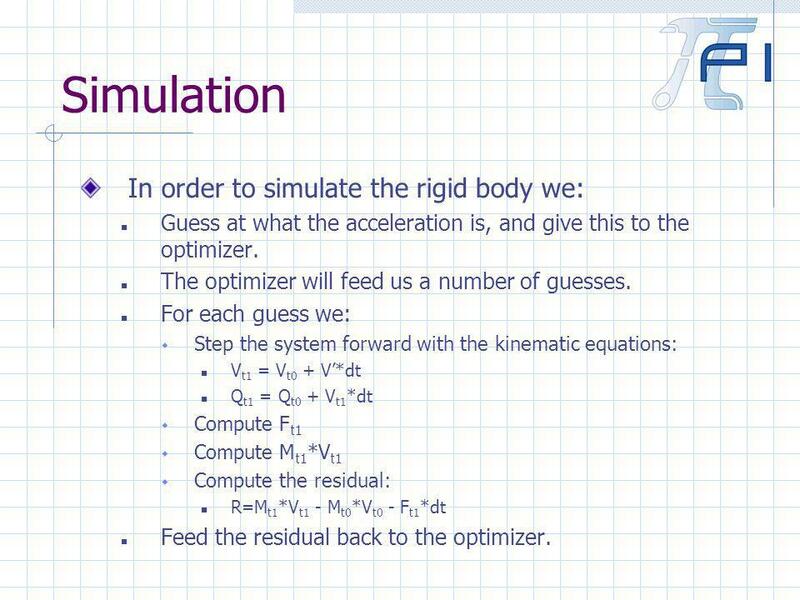 45 Simulation In order to simulate the rigid body we: Guess at what the acceleration is, and give this to the optimizer. 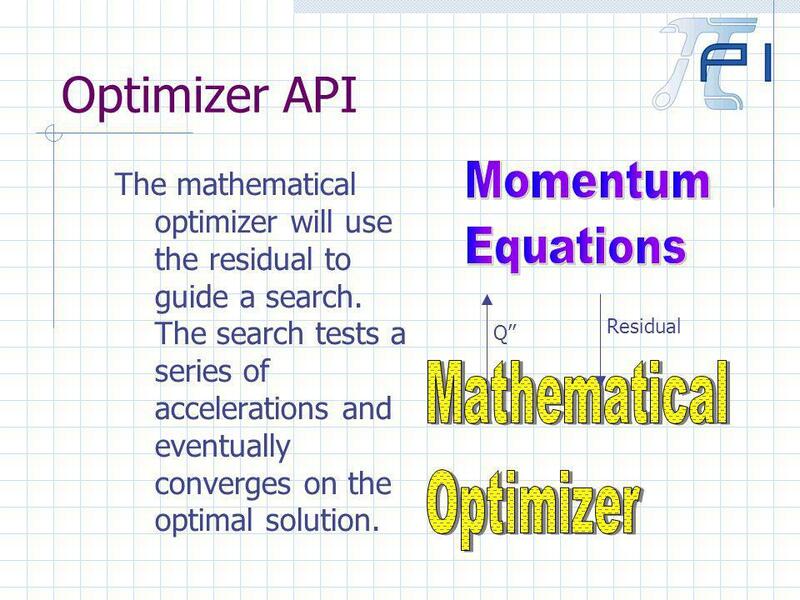 The optimizer will feed us a number of guesses. 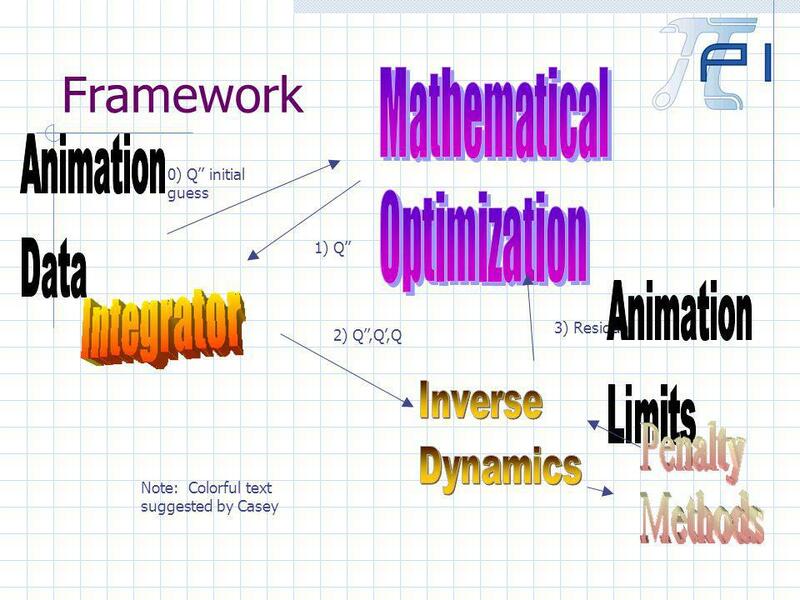 For each guess we: Step the system forward with the kinematic equations: V t1 = V t0 + V*dt Q t1 = Q t0 + V t1 *dt Compute F t1 Compute M t1 *V t1 Compute the residual: R=M t1 *V t1 - M t0 *V t0 - F t1 *dt Feed the residual back to the optimizer. 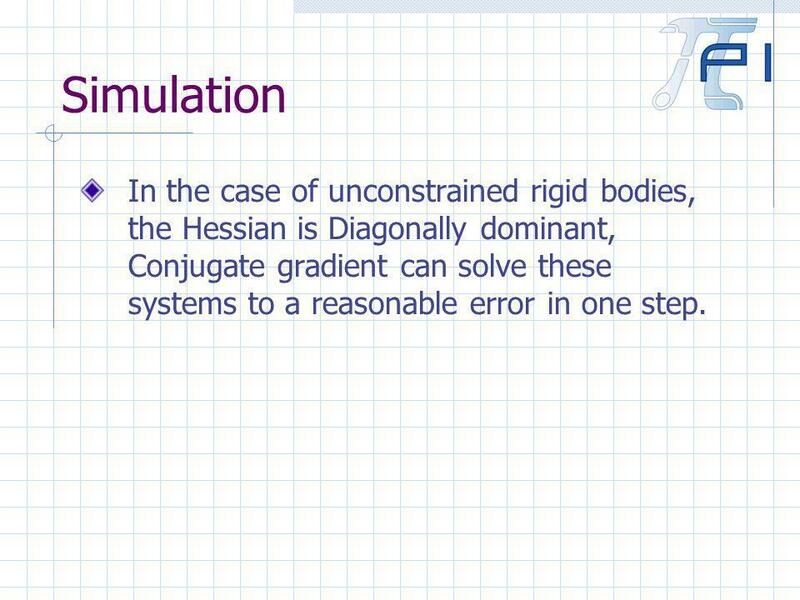 46 Simulation In the case of unconstrained rigid bodies, the Hessian is Diagonally dominant, Conjugate gradient can solve these systems to a reasonable error in one step. 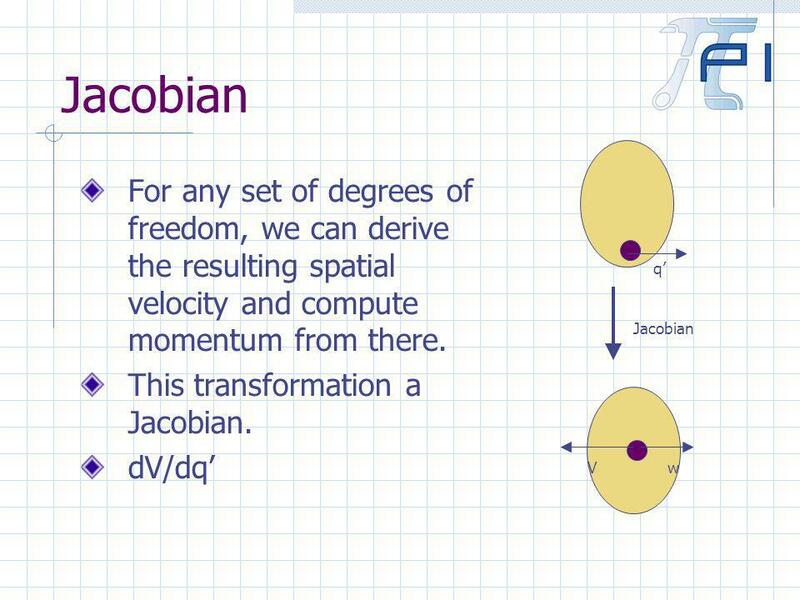 49 Degrees of Freedom In the case of a single unconstrained rigid body, the Spatial velocity vector is a natural choice to represent degrees of freedom. 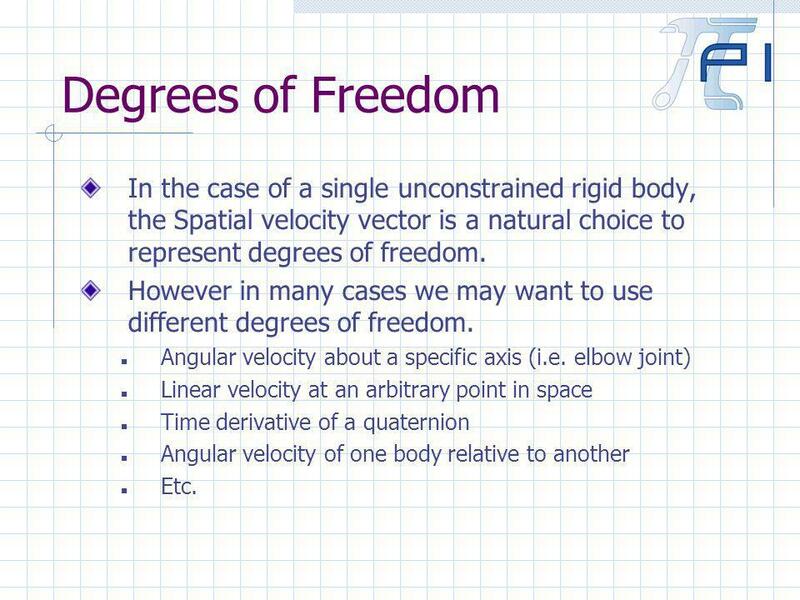 However in many cases we may want to use different degrees of freedom. 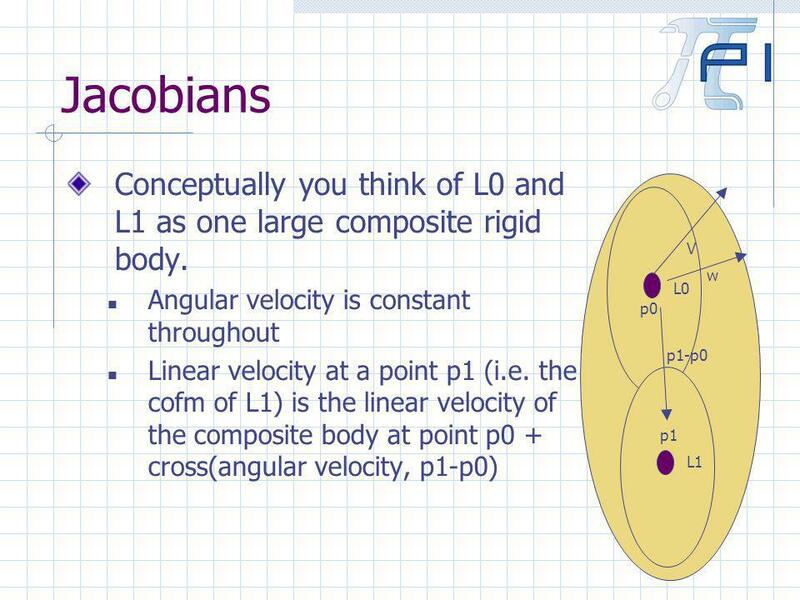 Angular velocity about a specific axis (i.e. 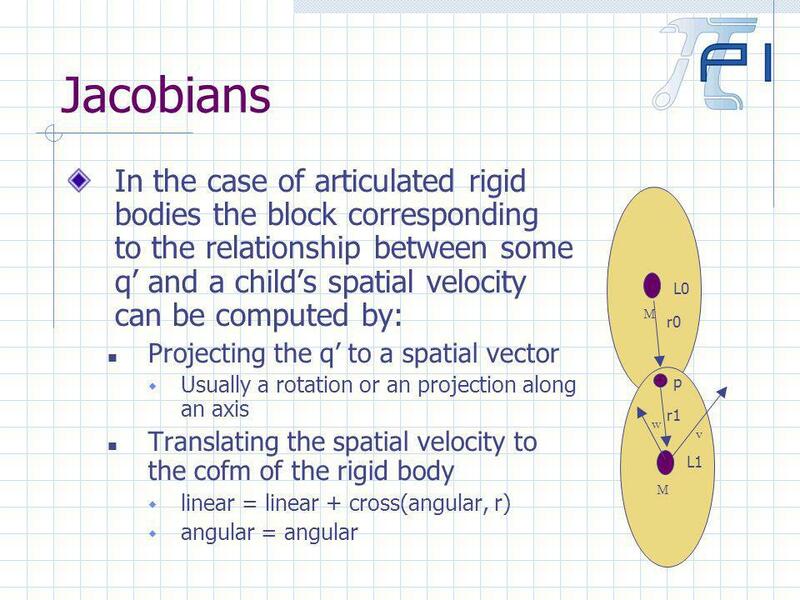 elbow joint) Linear velocity at an arbitrary point in space Time derivative of a quaternion Angular velocity of one body relative to another Etc. 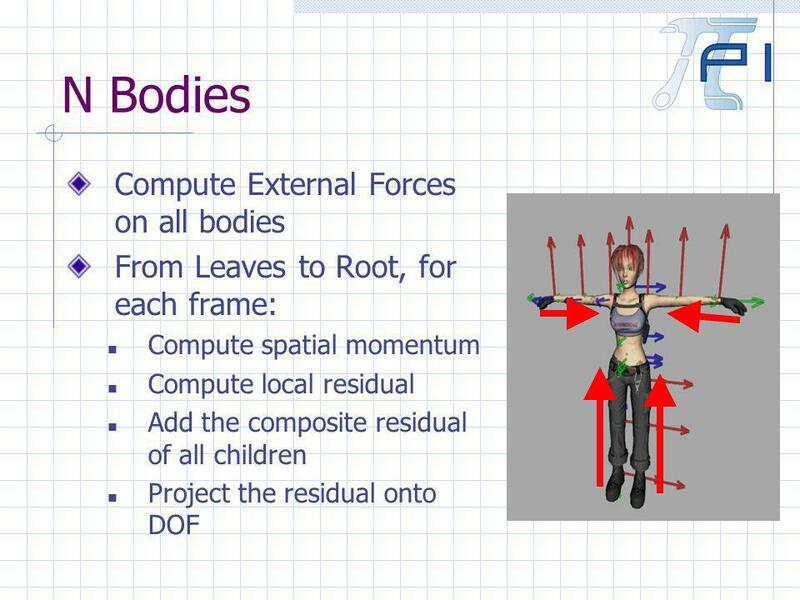 67 N Bodies This solution is readily extendable to tree structured mechanisms with an arbitrary number of degrees of freedom. I.e. 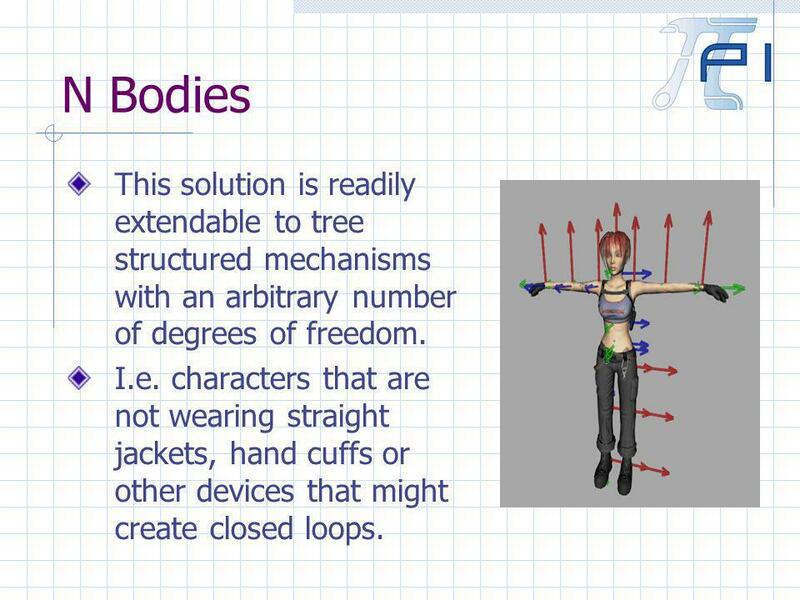 characters that are not wearing straight jackets, hand cuffs or other devices that might create closed loops. 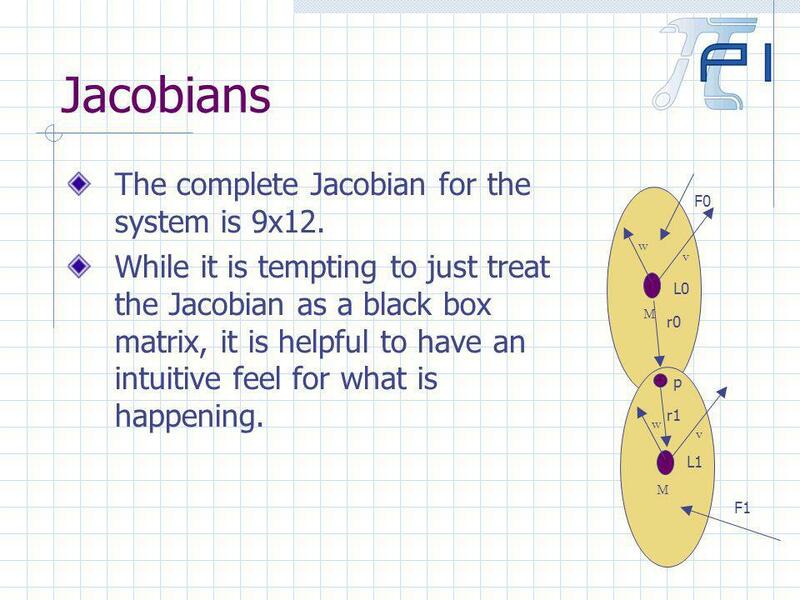 68 N Bodies Direct computation of the Jacobian requires O(n 2 ) time and O(n 2 ) space. 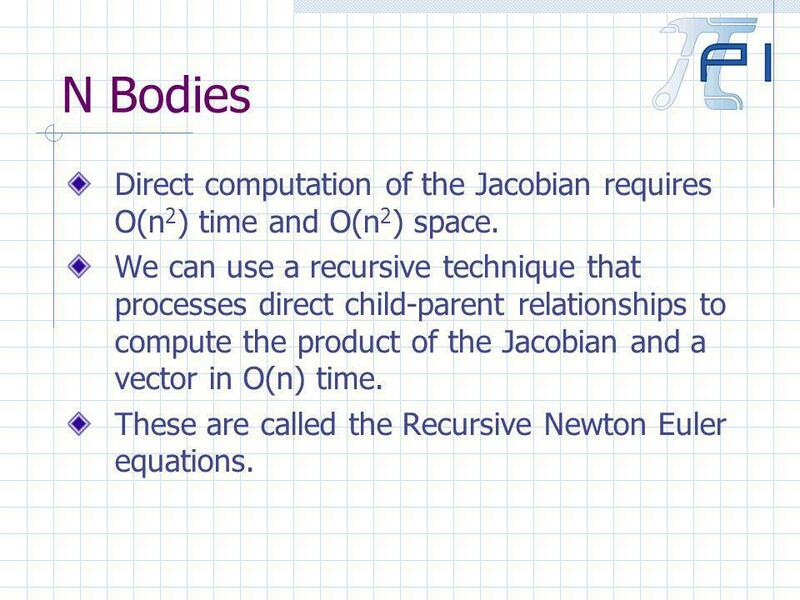 We can use a recursive technique that processes direct child-parent relationships to compute the product of the Jacobian and a vector in O(n) time. 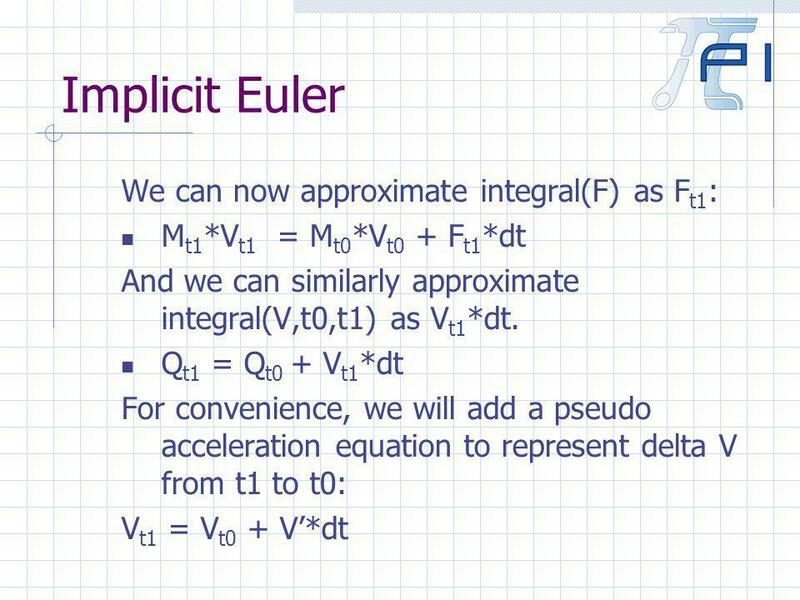 These are called the Recursive Newton Euler equations. 69 N Bodies The process is a straight forward extension of what was used to solve the two body case. From Root to Leaves: Each frame uses its acceleration to update its relative velocity, position and orientation. 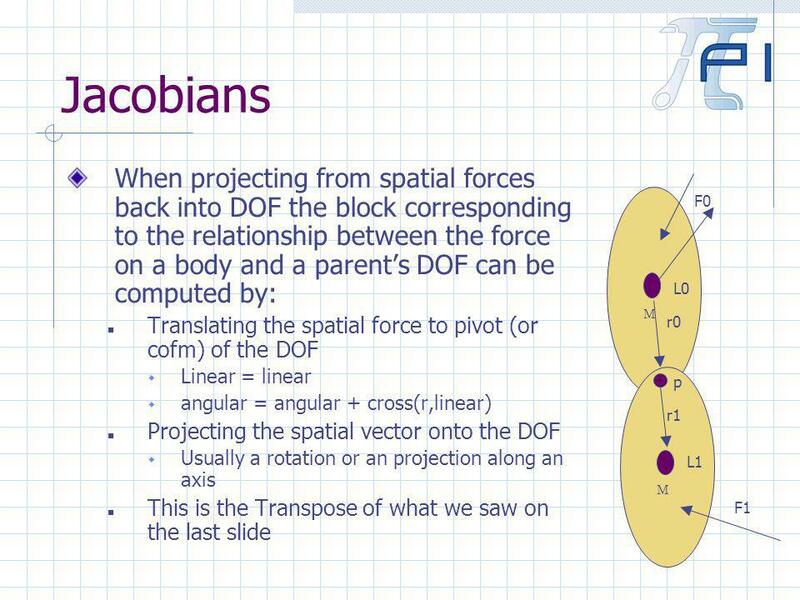 Frames combine the effects of their relative DOF with their parents composite spatial DOF to compute their new spatial DOF. 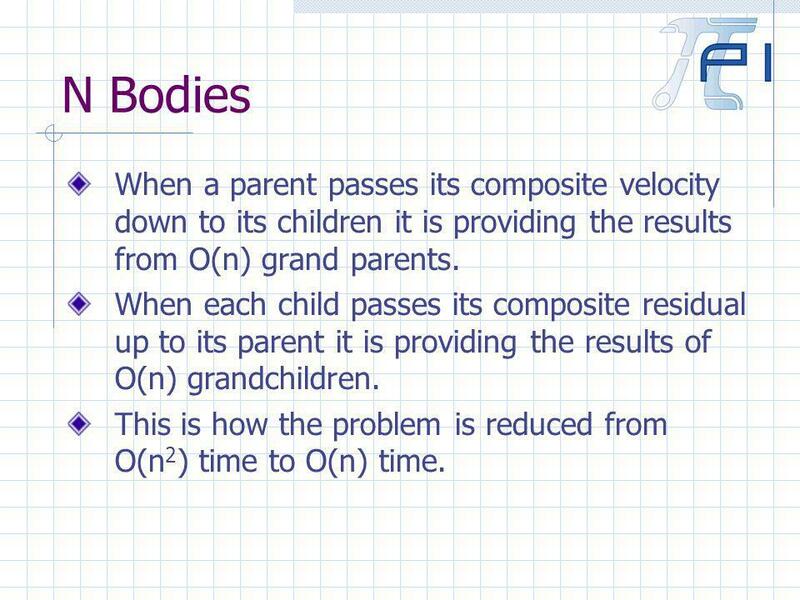 71 N Bodies When a parent passes its composite velocity down to its children it is providing the results from O(n) grand parents. When each child passes its composite residual up to its parent it is providing the results of O(n) grandchildren. 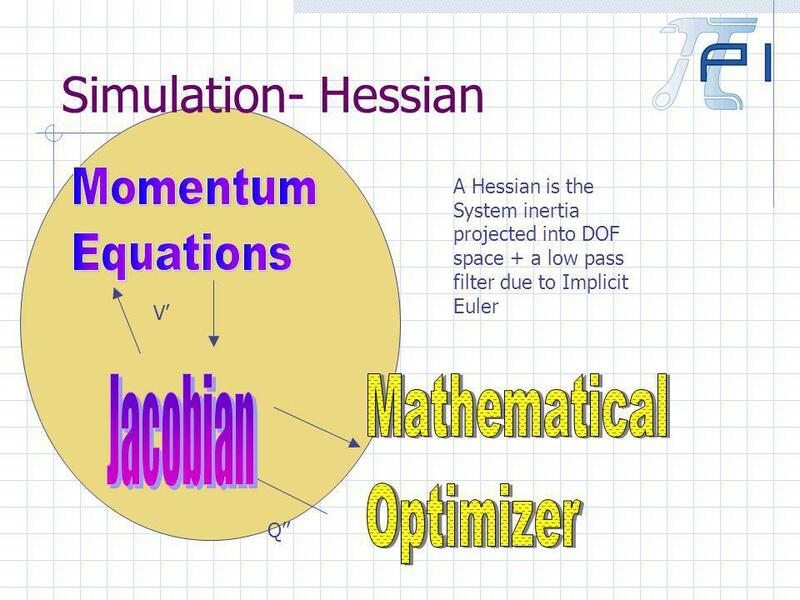 This is how the problem is reduced from O(n 2 ) time to O(n) time. 74 Forward Dynamics This technique can be extended to forward dynamics I.e. 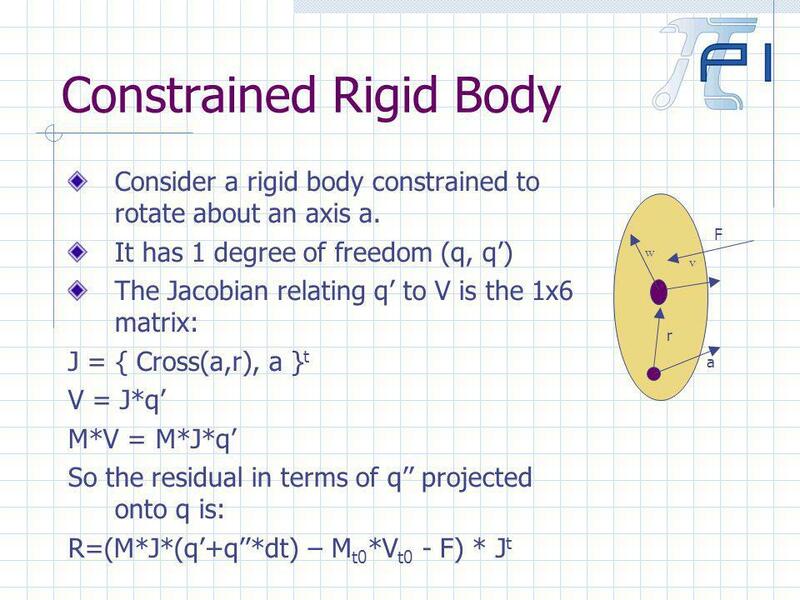 the Articulated rigid body method Unfortunately when you have constraints and closed loops (i.e. contacts) things rapidly increase above O(n) time. 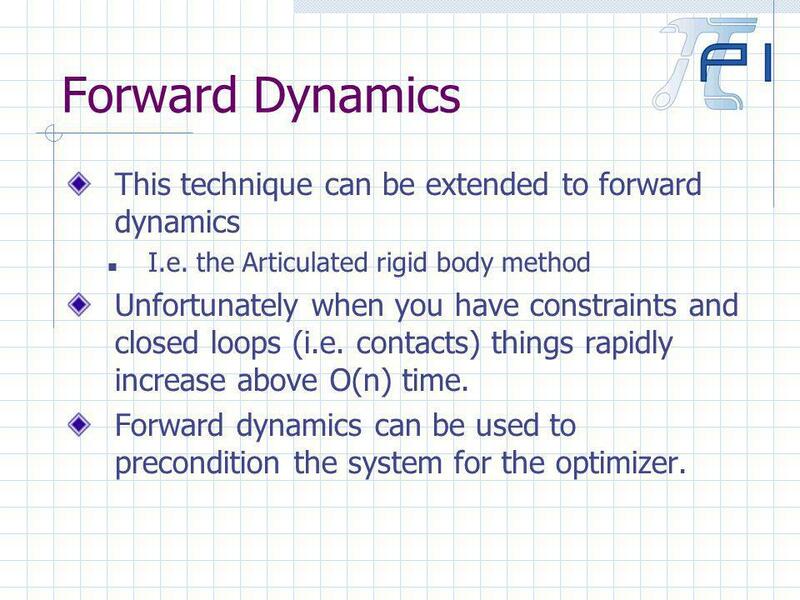 Forward dynamics can be used to precondition the system for the optimizer. 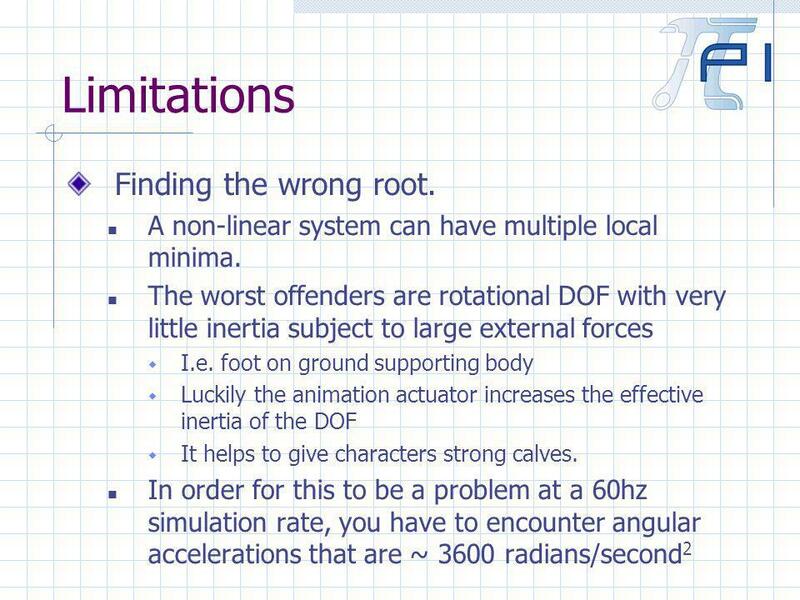 75 Kinematics A convenient property of this solution is that specific DOF can be set to kinematic with very few changes: The accelerations of the kinematic DOF are not given to the mathematical optimizer, instead they are assumed to be constants. 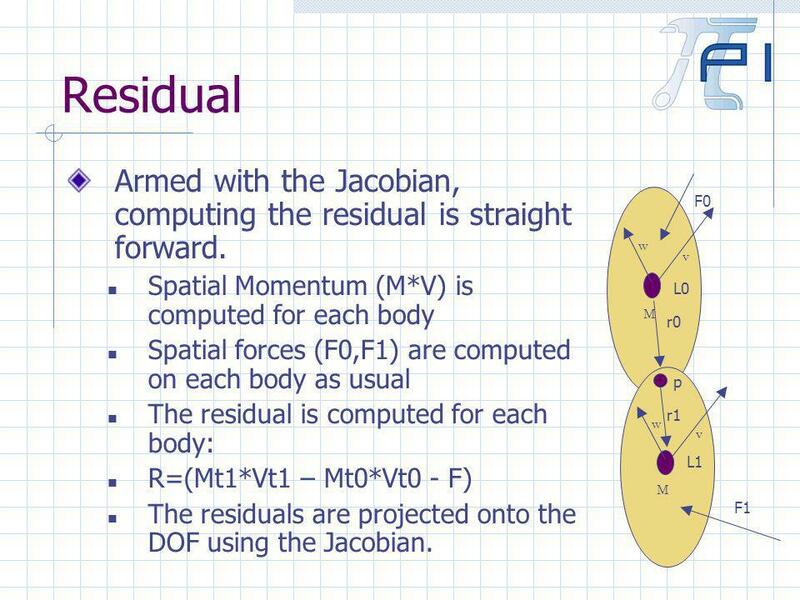 When the residual is computed for Kinematic DOF, it is not given back to the optimizer. 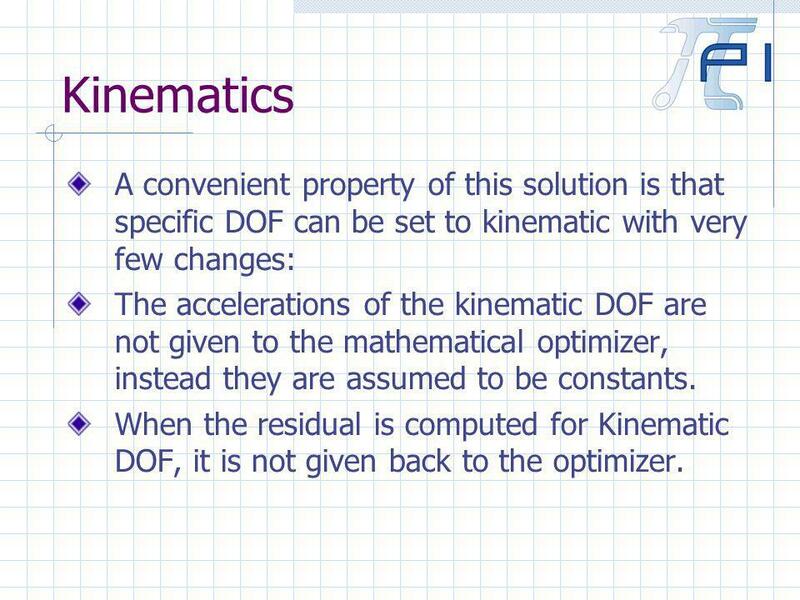 76 Kinematics Kinematic DOF reduce the number of unknowns that the optimizer has to solve for. 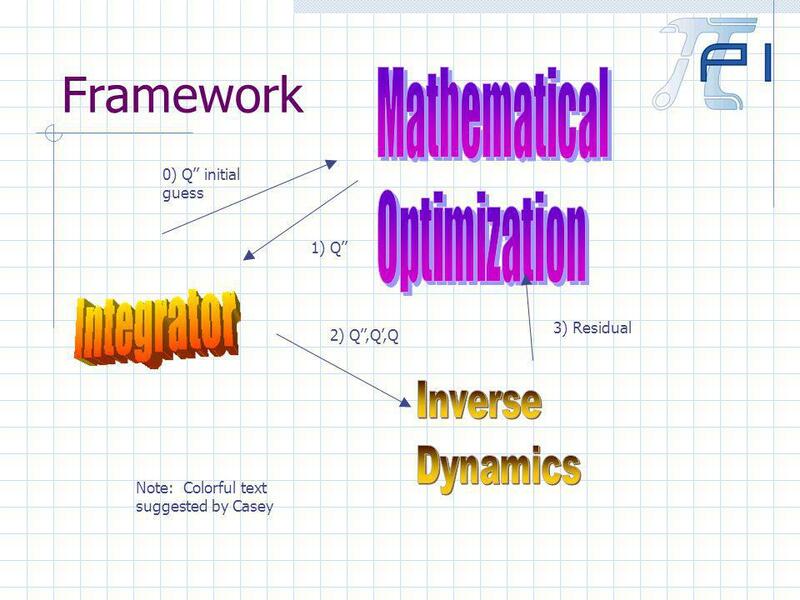 This improves convergence and speeds up the solution. 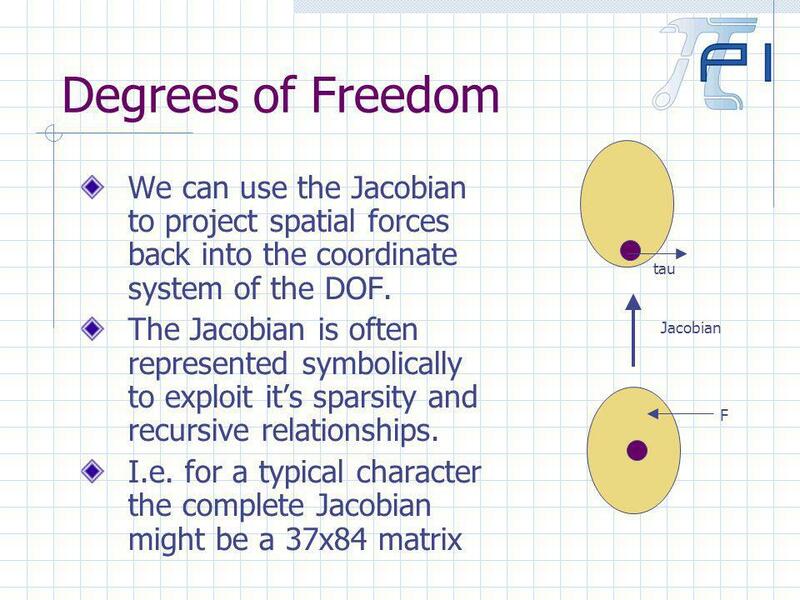 A technique that we use to LOD simulation is to Bake certain DOF when stress is high. I.e. 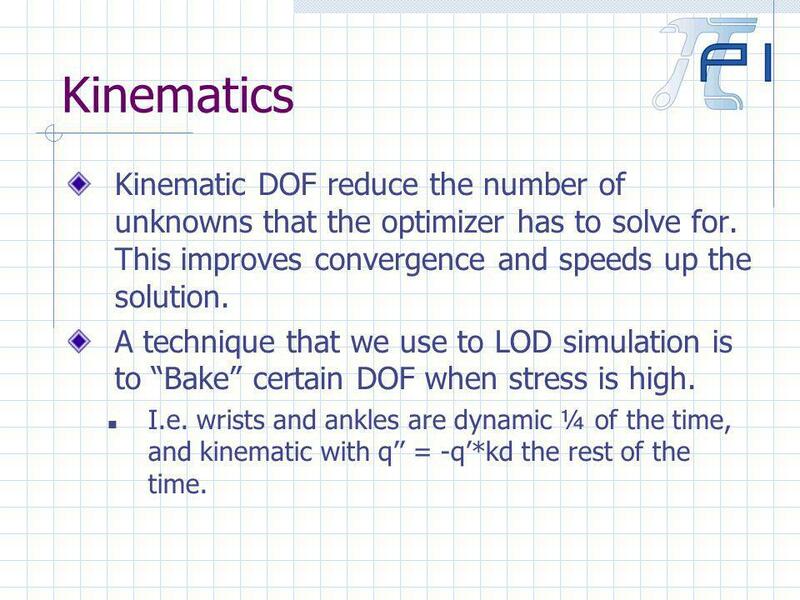 wrists and ankles are dynamic ¼ of the time, and kinematic with q = -q*kd the rest of the time. 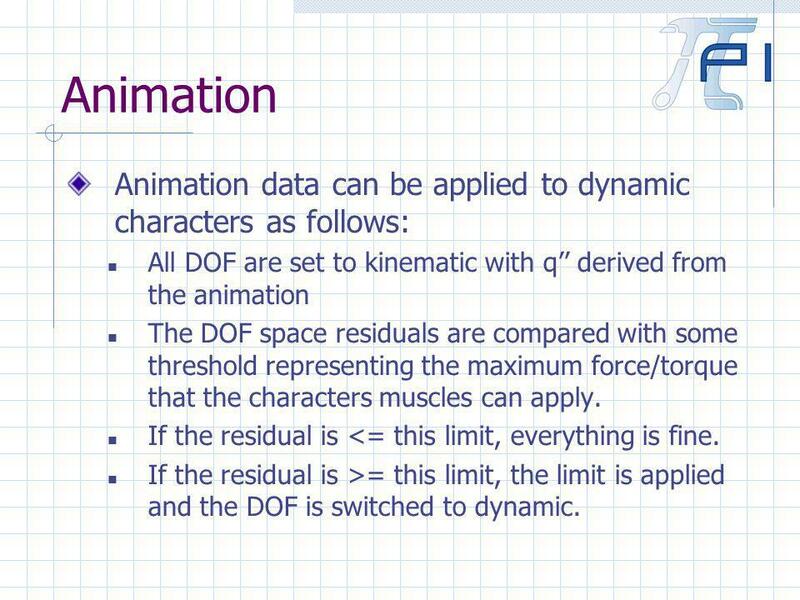 77 Animation Animation data can be applied to dynamic characters as follows: All DOF are set to kinematic with q derived from the animation The DOF space residuals are compared with some threshold representing the maximum force/torque that the characters muscles can apply. If the residual is <= this limit, everything is fine. 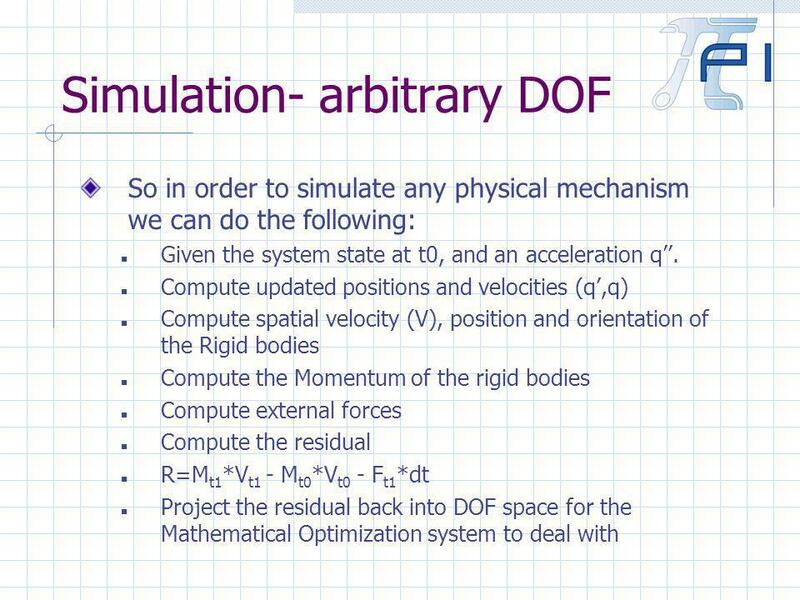 If the residual is >= this limit, the limit is applied and the DOF is switched to dynamic. 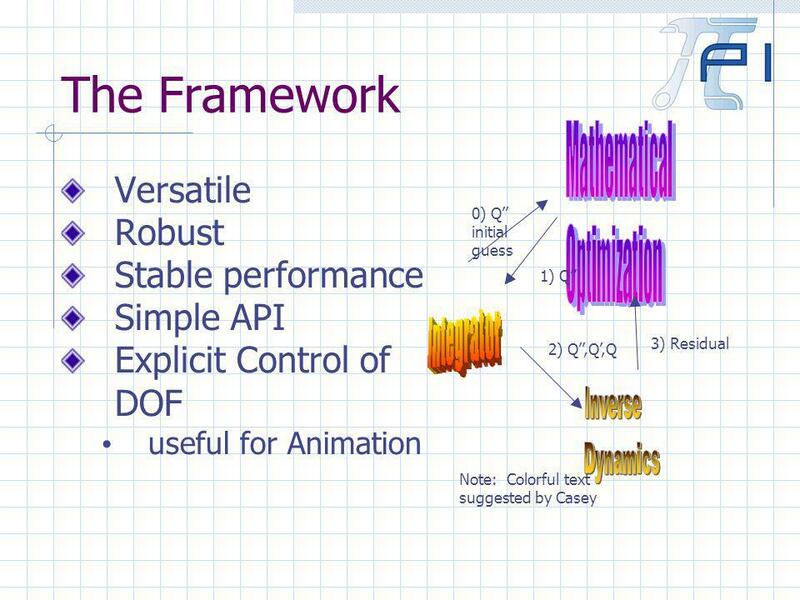 78 Animation This provides a very efficient mechanism to combine animations with physics. 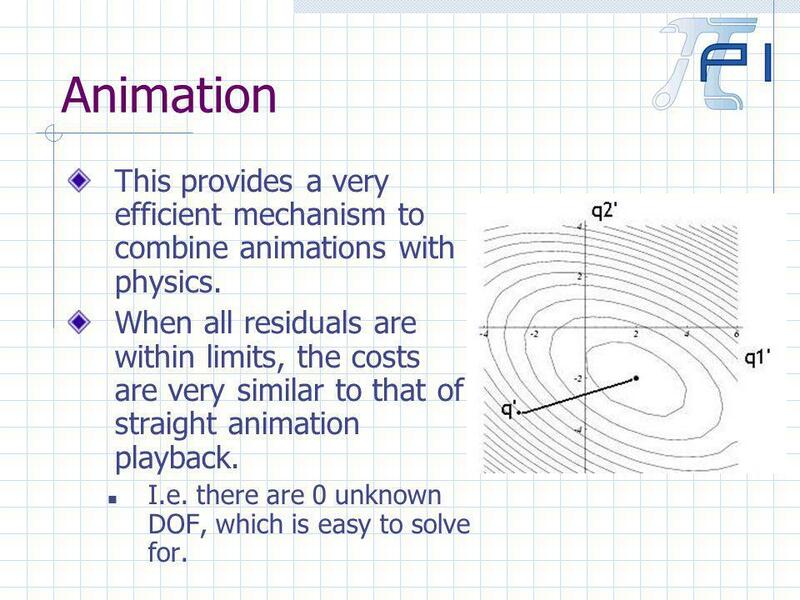 When all residuals are within limits, the costs are very similar to that of straight animation playback. I.e. 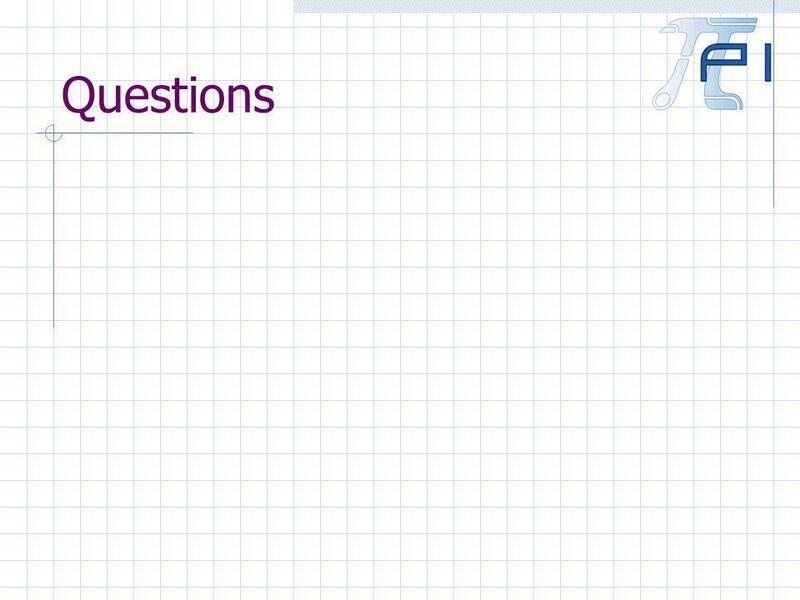 there are 0 unknown DOF, which is easy to solve for. 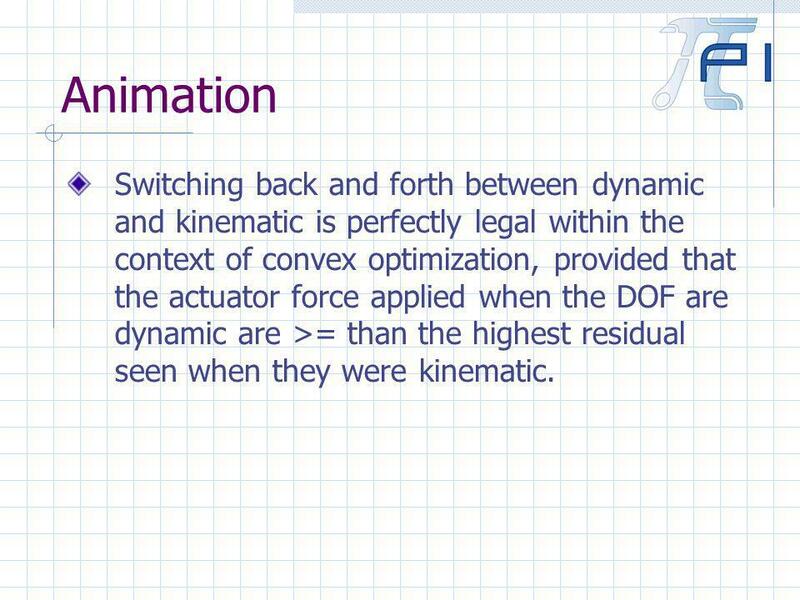 79 Animation Switching back and forth between dynamic and kinematic is perfectly legal within the context of convex optimization, provided that the actuator force applied when the DOF are dynamic are >= than the highest residual seen when they were kinematic. 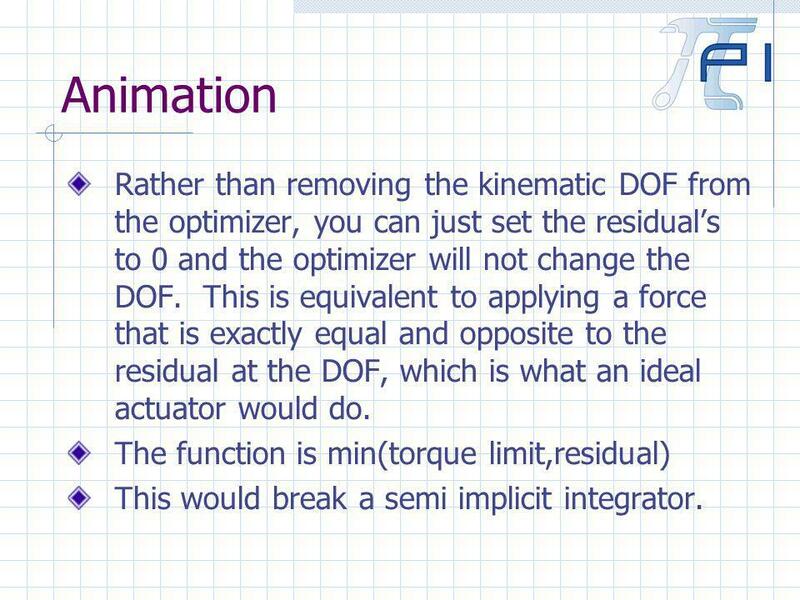 80 Animation Rather than removing the kinematic DOF from the optimizer, you can just set the residuals to 0 and the optimizer will not change the DOF. 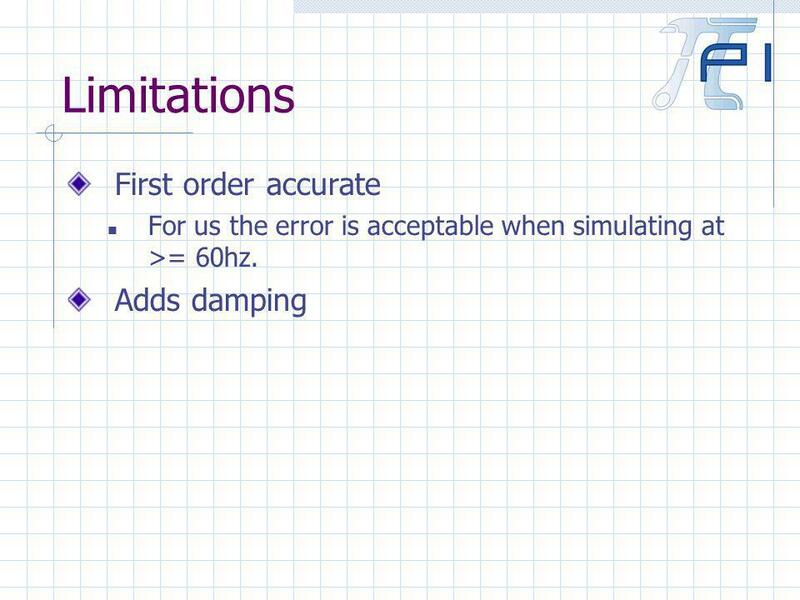 This is equivalent to applying a force that is exactly equal and opposite to the residual at the DOF, which is what an ideal actuator would do. 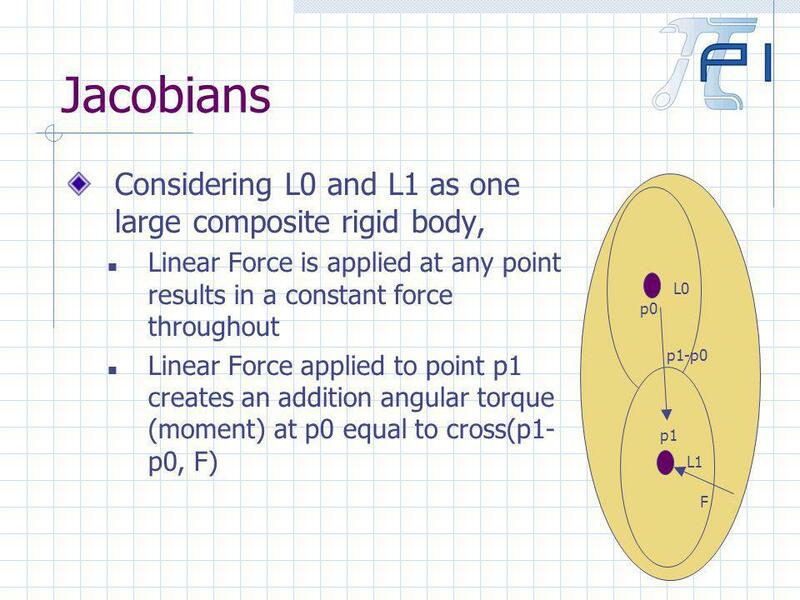 The function is min(torque limit,residual) This would break a semi implicit integrator. 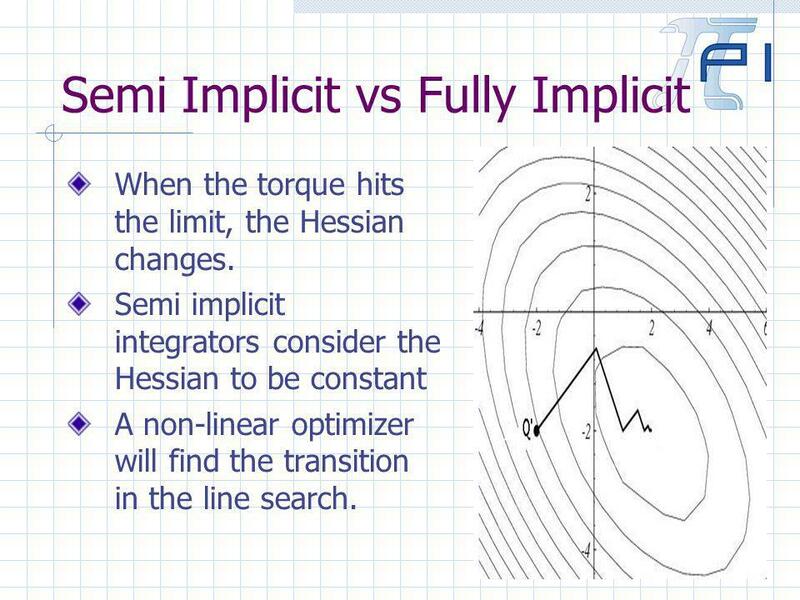 81 Semi Implicit vs Fully Implicit When the torque hits the limit, the Hessian changes. 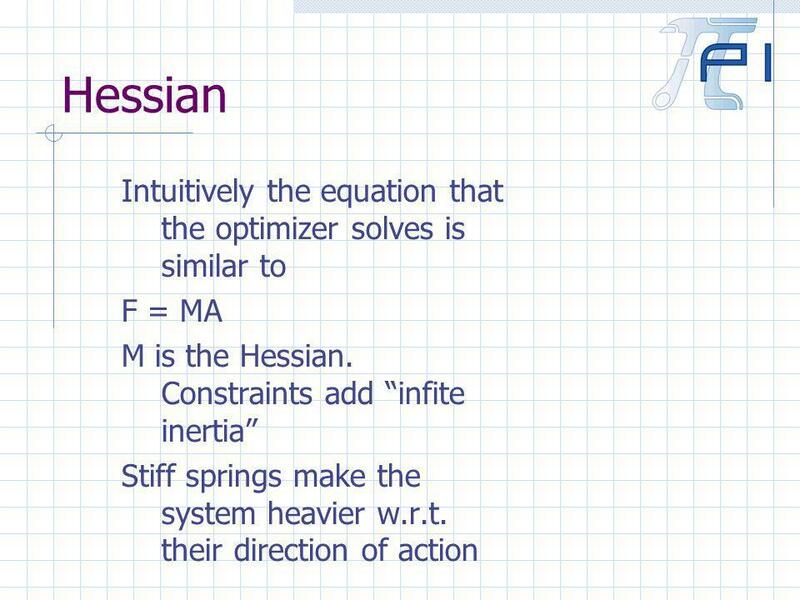 Semi implicit integrators consider the Hessian to be constant A non-linear optimizer will find the transition in the line search. 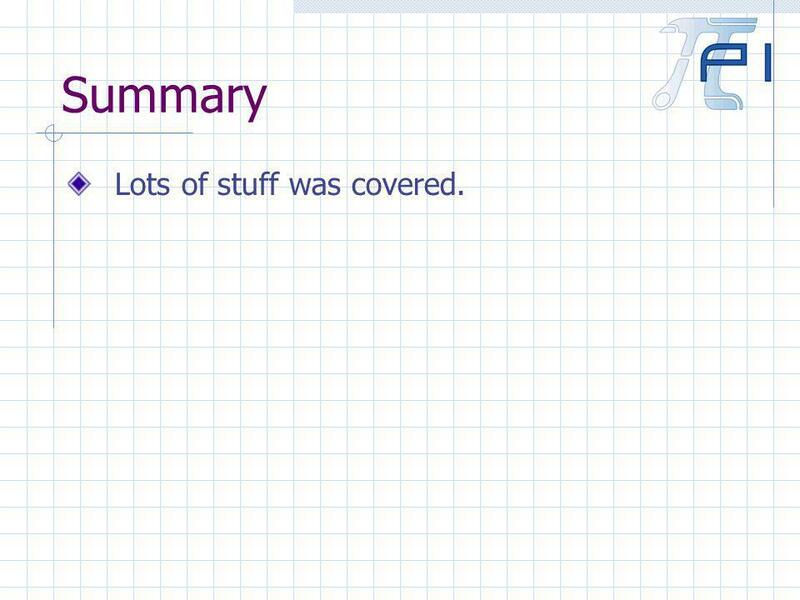 84 Summary Lots of stuff was covered. 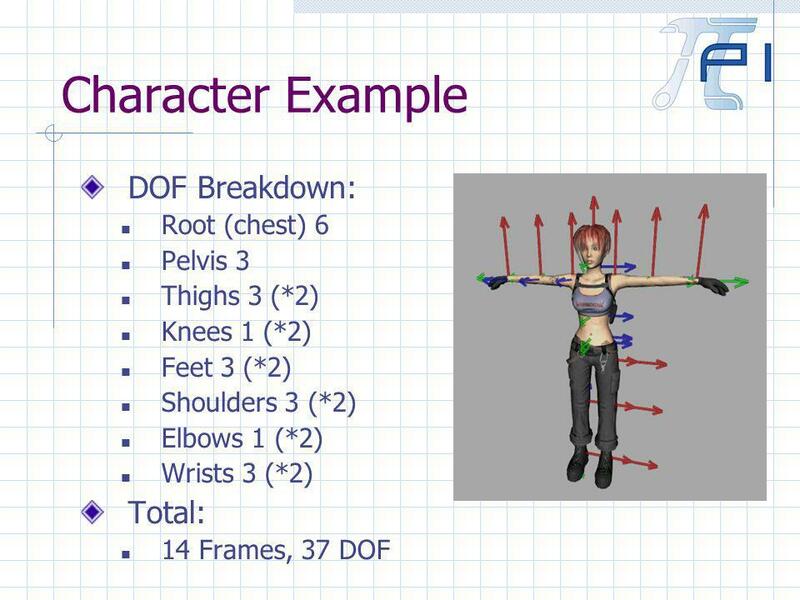 Download ppt "Character Physics and Animation in Full Auto David Wu Pseudo Interactive." Rotation and Torque Lecture 09 Thursday: 12 February 2004. 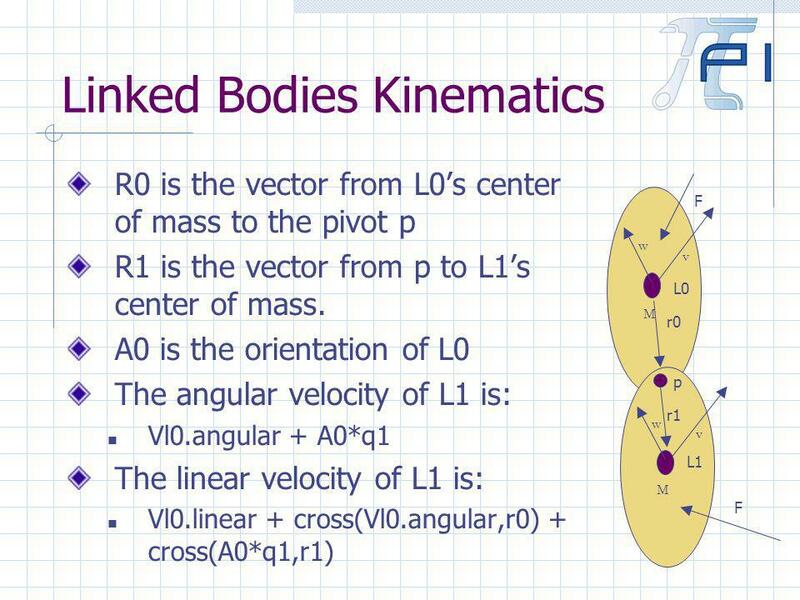 Dynamics of Articulated Robots Kris Hauser CS B659: Principles of Intelligent Robot Motion Spring 2013. 1cs542g-term Notes. 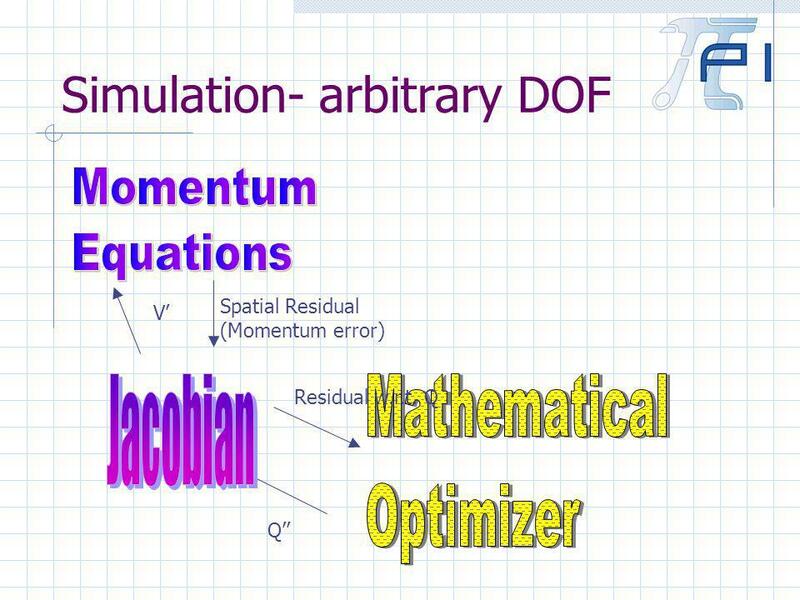 2 Solving Nonlinear Systems  Most thoroughly explored in the context of optimization  For systems arising in implicit time. ME 4135 Fall 2011 R. R. Lindeke, Ph. 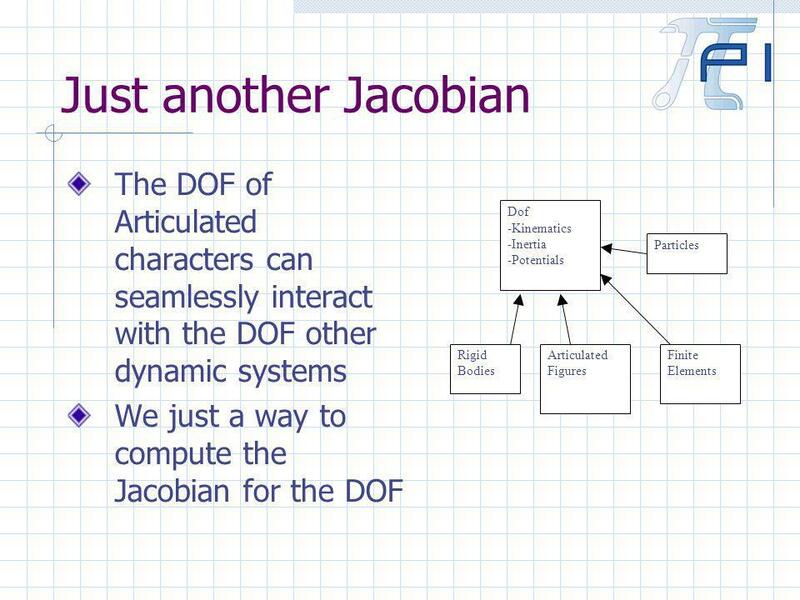 D. Robot Dynamics – The Action of a Manipulator When Forced. 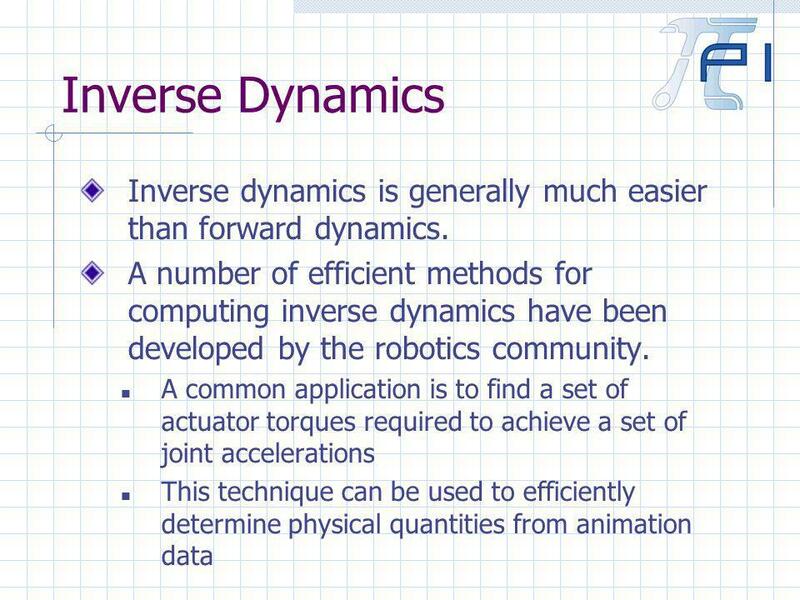 ME Robotics Dynamics of Robot Manipulators Purpose: This chapter introduces the dynamics of mechanisms. 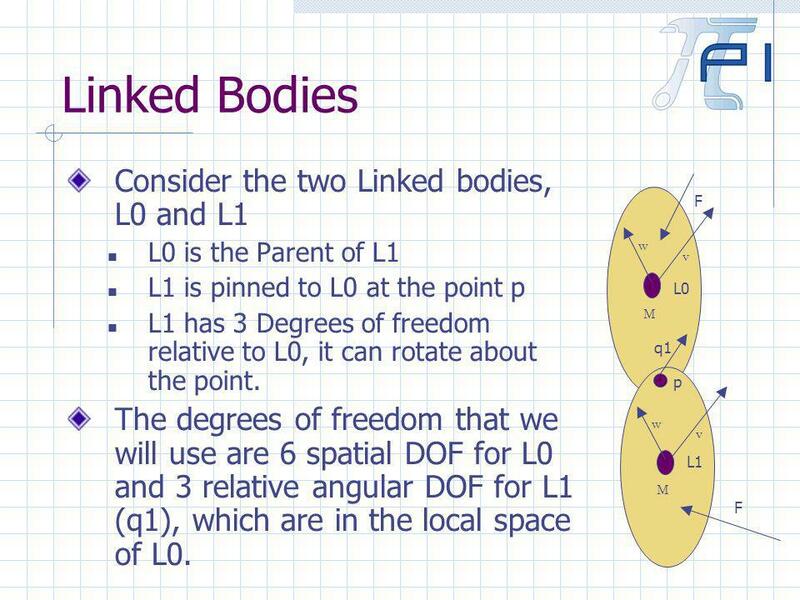 A robot can be treated as a set of linked. 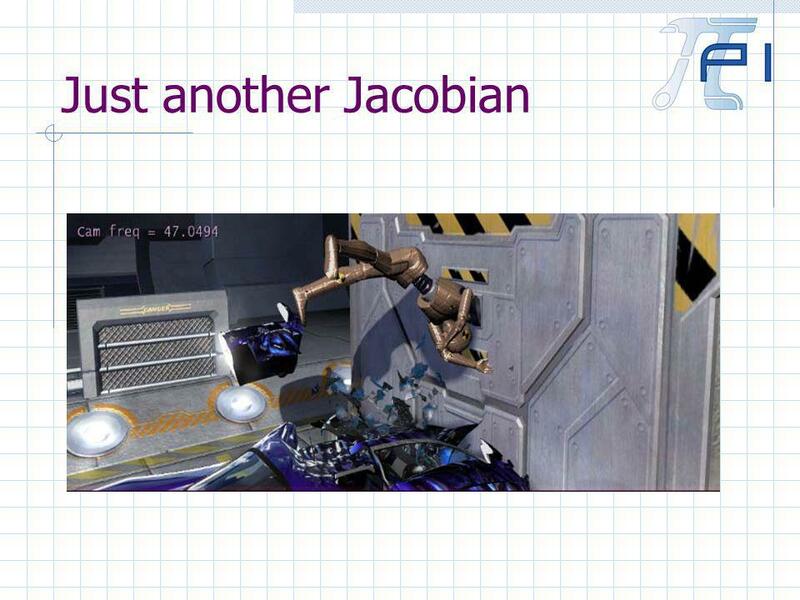 Interactive Animation of Structured Deformable Objects Mathieu Desbrun Peter Schroder Alan Barr.